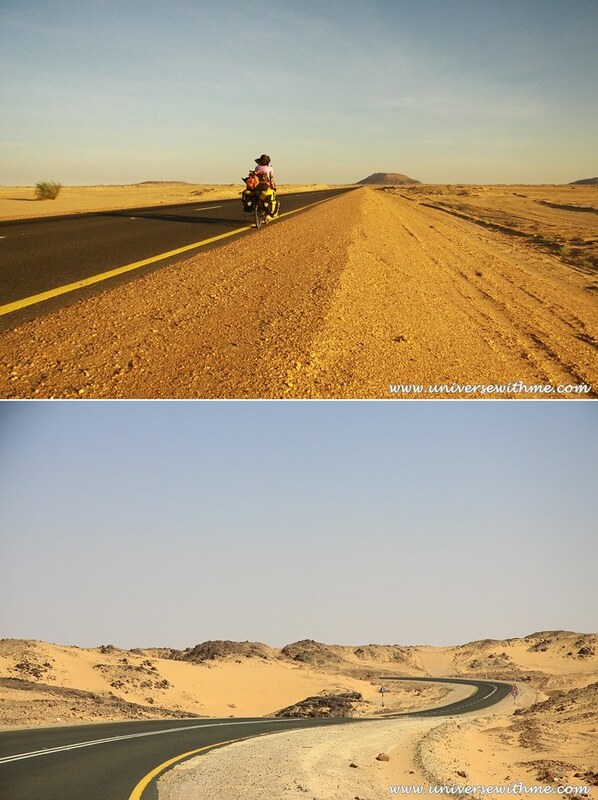 Epic Africa:To cycle from South Africa to Egypt for one year alone! I was thinking of my plan when I was almost finishing Americas trip. Should I keep going or going back home? I stayed in Canada with Working Holiday Visa for a year and I had cycled for one year and four months in Americas. It meant I didn’t go home over two and half years. I felt like it was too long to be away home. Also, I was not sure that it was possible to cycle in Africa as a solo girl. But I wanted to see the world more. I had asked other travelers who had been there. They told me it could be possible because I had survived in Latin America alone. After long thinking, I decided to buy the ticket which costed over $1,200. I got the pressure of money from the beginning of Africa trip. I told myself ‘Let’s cycle until run out of money. If it is too scary to cycle, then let’s fly to Europe from Africa.’ I chose Eastern Africa for the route, because it looked easy to get visa and less possibility of getting diseases. I got shocked when I arrived at the airport of Sao Paulo in Brazil because I could not get a ticket which I already paid. They told me I did need International Certification of Yellow Fever to enter into South Africa. I had Colombia Certification of Yellow Fever, but they said an airport of South Africa would kick me out if I didn’t have International one. I run to an office and talked to a manager. He told me if I am so lucky, it won’t happen. He had seen that some people had no problem without international certification of Yellow Fever, but some people were kicked out and wasted their ticket. I took the plane at 31st of December. It took more than 10 hours that I spent New Year on the plane and got champagne for celebrating NEW YEAR. I tried to think only positive thing during flying. When I got to South Africa, actually I got a stamp very easily without many questions. It was very adventure from the beginning of Africa trip. 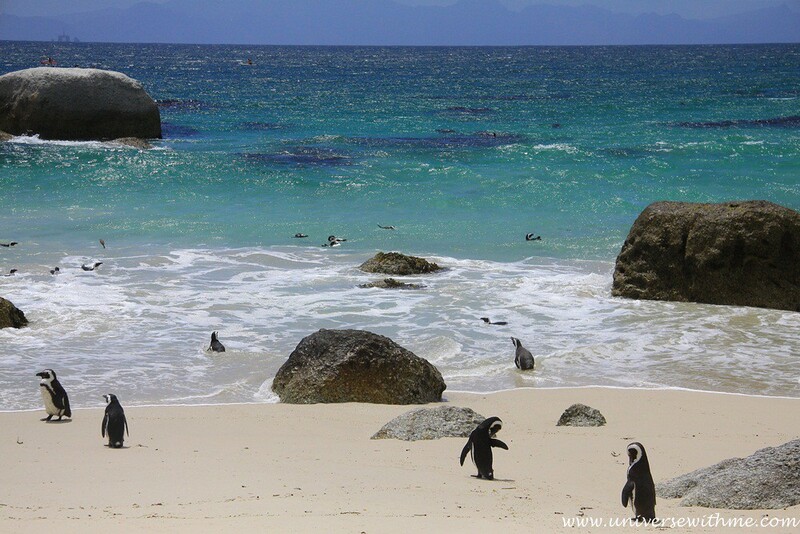 One of things to do in Cape Town was to watch penguins. The place was a bit far from the city that I had to take a subway. Subway was separated by two different seats, the first class and the second class. It was surprising at the beginning that I could see so many Caucasian (White people) in South Africa. The reason was like this. In 15 century, European started to come to South Africa and in 17 century people from the Netherlands settled down here. In 19 century England started to come and in 20 century British won the war against the Netherlands. And then British colonized South Africa and made weird law, Apartheid. Apartheid were the law about separating African from Caucasian. So, African could not go to the same school where Caucasian went. There was no such a human right for African from 1948 to 1994. Since 1994, Apartheid had been abolished by Nelson Mandela, first African president. I thought that the seat was separated by two kinds was the remain of Apartheid, because there was no difference between first class and second class on the subway. 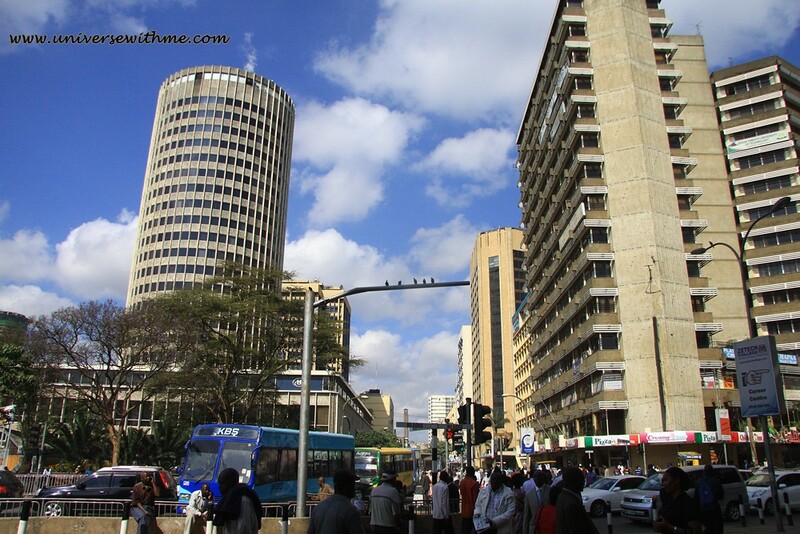 The city was well-developed that I could not believe I was in Africa. Many houses were nice like North American’s house that I was too nervous to ask to pitch my tent at their yard. Even the weather was not much hot and it was really cold in the night. Where was I in??? Cars in South Africa were drive on the left side because of being colonized by England in the past. I was confused at the beginning on my bicycle. I saw poor area after a week in South Africa. It was far from the city. People gave me advise that I should not go there by myself because it would be dangerous. When I passed a huge grape farm, someone told me that there was demonstration. Usually worker got 80 Rand (10$) per day. They were on strike to get 120 Rand (15$). 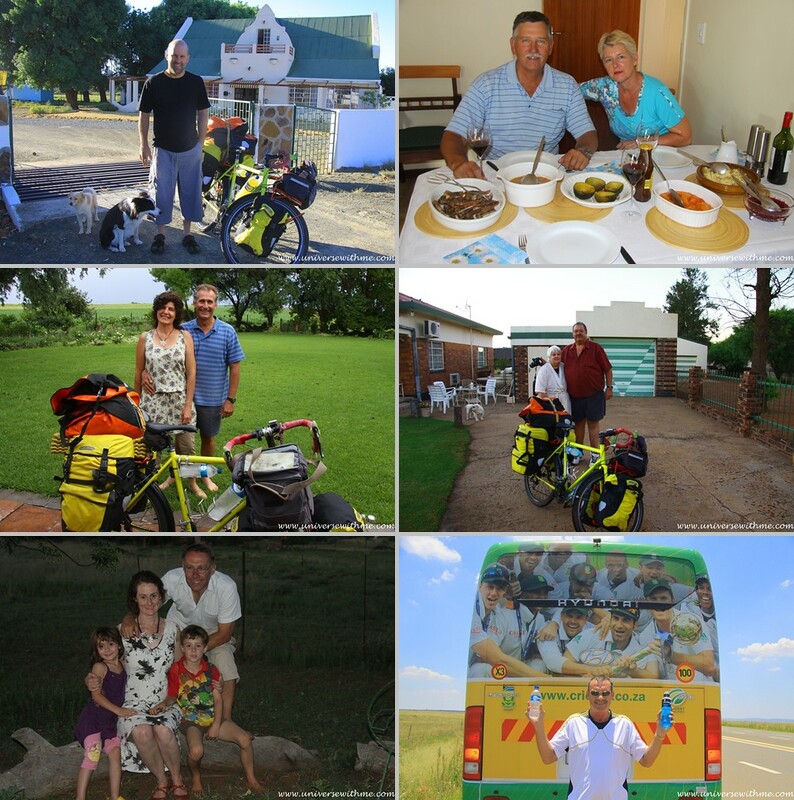 To cycle in South Africa was actually scary thing because South Africa had a very high rate of crime. South Africa was ranking on 9th for the rate of crime. The first one was Honduras in Central America. After Nelson Mandela, the politic went wrong way that now it was out of control at crime. Someone told that the politicians didn’t care about crime at some point because they wanted to let local African kill Caucasian African. But the crime only didn’t happen to Caucasian African, but to everybody now. 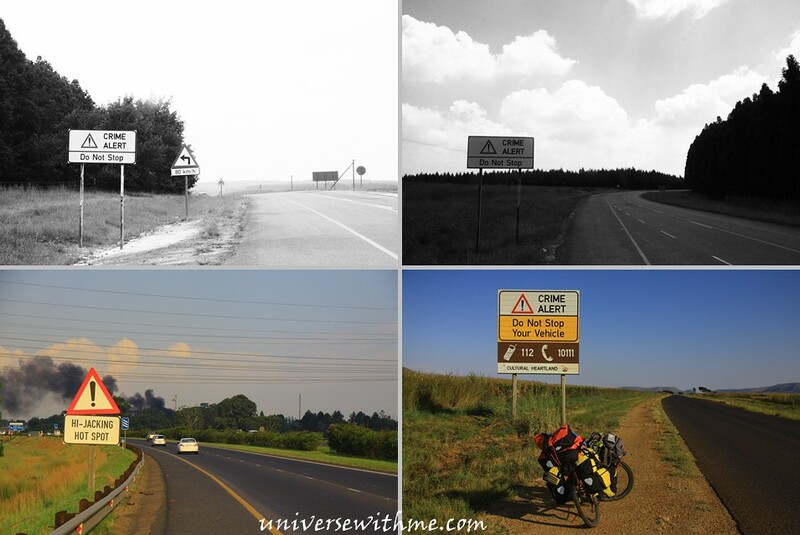 I had heard lots of horrible story about crime while cycling in South Africa. Many Caucasian and middle class were afraid of being murdered or robbed at their house. 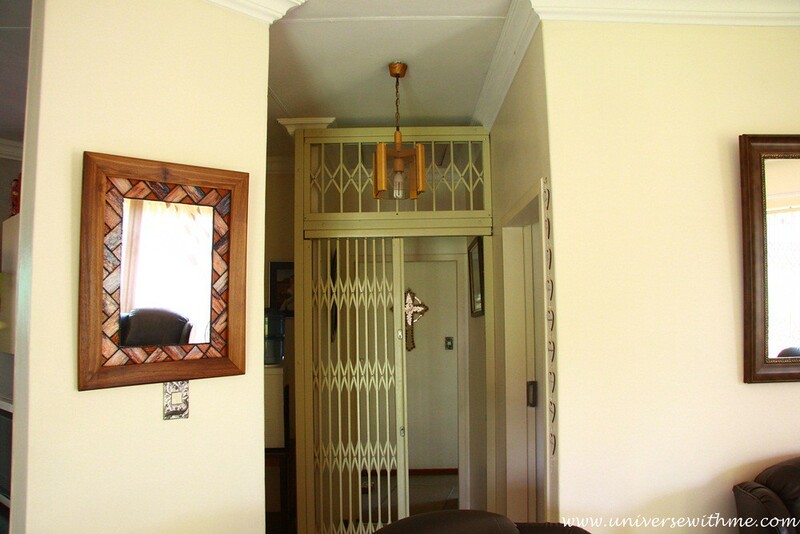 Some of them had iron bars in front of their bed room like the picture. One of my host told me that her daughter was teaching English in Korea to make money for her law school. 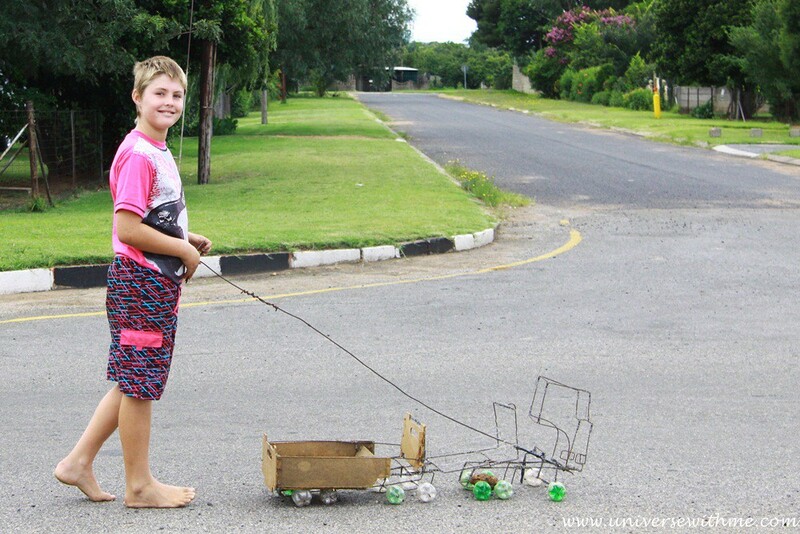 I heard that many South African work in other country because of money and safety. At some area, I had to face scariest traffic sign “Crime Alert! Do Not Stop”, “Hi Jacking Hot Sot” which I’ve never seen on the trip. There was nothing to do except keeping calm and cycling. Since the second week in South Africa, I was invited at Caucasian houses everyday. I thought that Caucasian South African was the kindest tribe I’ve ever met. When I asked them “Can I set up tent at your yard?”, then 90% of people let me sleep at their house and fed me. The best part was they introduced me the people who lived in the next city where I had to go. Also many people stopped me on the road to give me some money or something to eat or invite at their house. Weird thing was only Caucasian stopped although there were many African drivers. I didn’t know why it was like this. 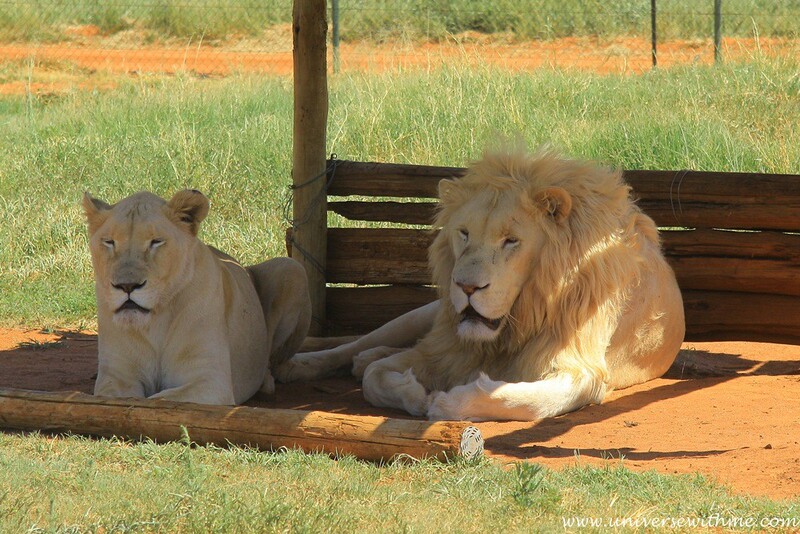 I was invited to lion farm from one of them. People can hunt a lion by legal in South Africa. The owner told me many rich Russian come to hunt. (The salary of many Russian is very low, but rich people in Russia are super extremely rich.). Usually it was 12,000$~36,000$ to hunt lions. If they hunt a female lion, it would be around two years old lion. If they hunt a male lion, it would be around 5 years old lion. So here was the way for hunting the lion. The worker put a lion under anesthesia. They drove to the forest after putting lion on a cage. They must release a lion before the lion woke up. Then a hunter walked in to bush by walking. Of course they would be some workers for emergency. If there was a big dangerous situation, workers would kill lions first. But it is still dangerous thing to hunt lion by walking that some of hunters got injured. After hunting lion, people got the skin of the lion they hunted. But they didn’t eat lion’s meat. 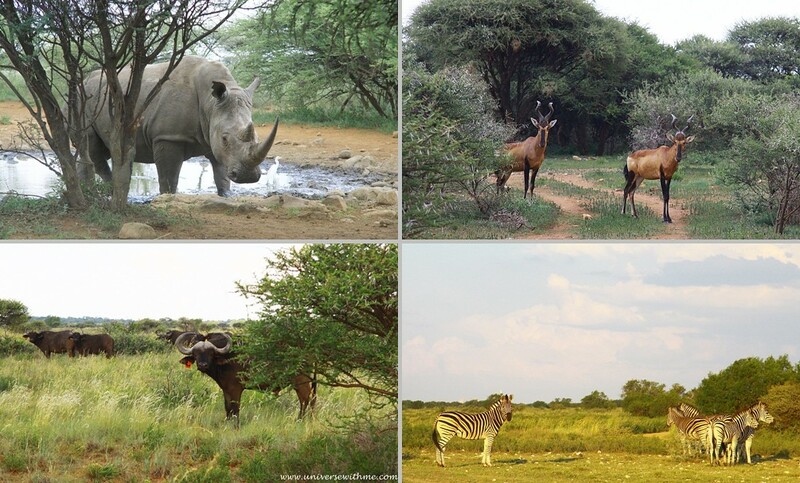 In South Africa, hunting was very popular that people could hunt many different kind of animal. To hunt small one would cost around $200~$300. To hunt giraffe would cost around $2,000. I was invited even at Safari. It made me feel like finally I was in Africa. I could see many different animals. I also saw rhinos. At that time I didn’t know that I was very lucky to see rhinos. Later I realized that to see rhinos was very difficult because there were not many rhinos left. It was because of superstition. Some rich people in South Asia believed that to eat horn of the rhino is healthy thing. But actually it is the same effect as eating nail. I went to school to share my story with students. Usually over 40 years old people in South Africa hated each other, different tribe. But on the picture they were well mixed. I believed that after many years they would have good relationship if it was like the picture. When you saw on the center of the picture, African child didn’t wear shoes like you saw many African children’s bare foot on TV. But then next to him, Caucasian girl didn’t wear shoes as well. Actually many of them in this school they didn’t wear shoes. They did like bare foot. I tried bare foot as well like them, but the gravel was too hot to touch so it was impossible for me. 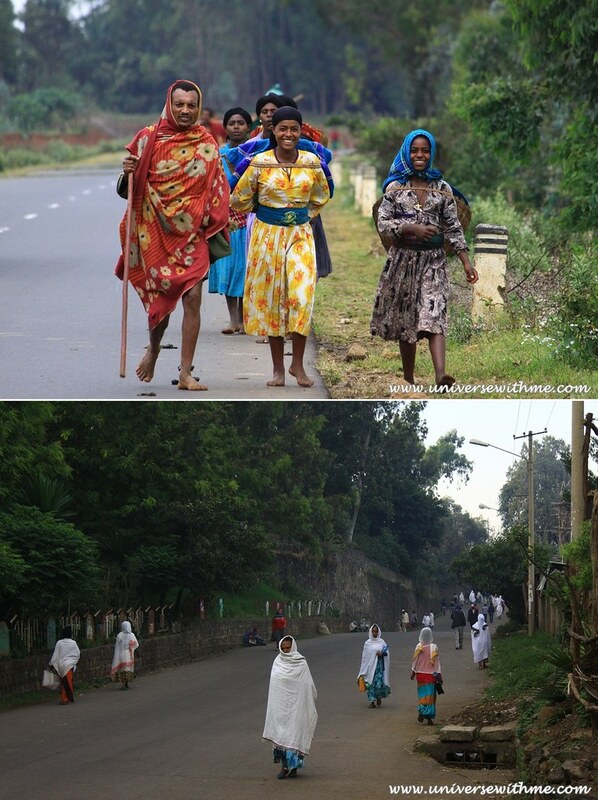 They walked with barefoot since little baby that they had callus on the foot. It was like typical image of Africa on TV. But I’ve seen this one as well. Both of them I’ve seen was not from poor family. 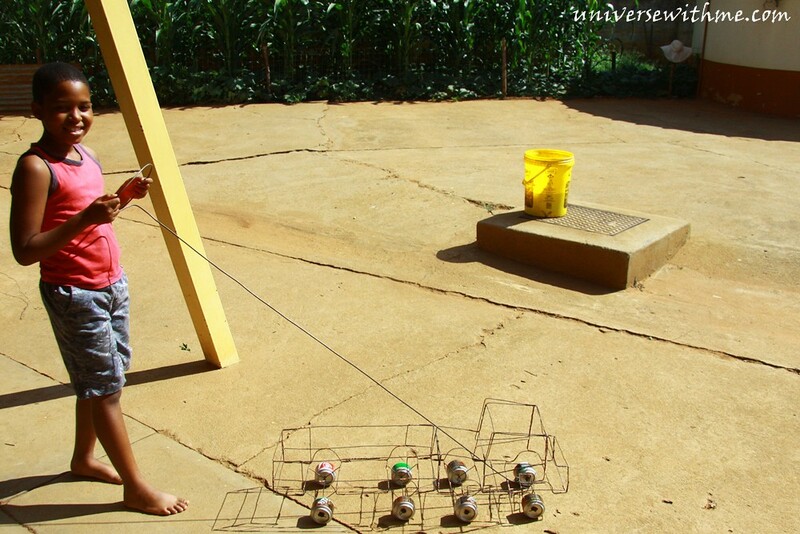 They just liked bare foot and the toy which their parent made for them. Television only showed extremely poorest African to get the highest viewing audience. The more I went up to north Africa, the poorer people were. But it was not worst as like Television. There were two small countries at the inside of South Africa, Swaziland and Lesotho. I went to one of them, Swaziland. The pronunciation is like Switzerland in Europe, but it is typical African country that they were high rate of Aids, one king(dictator), and low GDP. 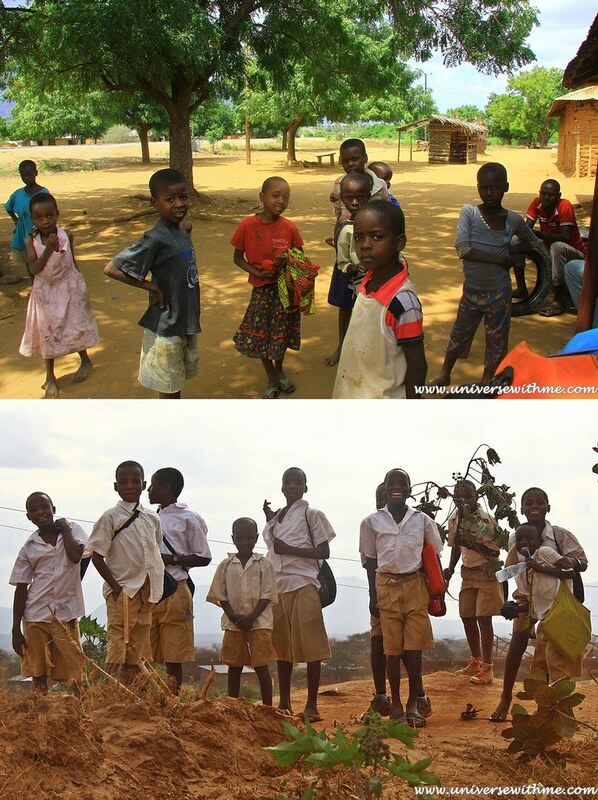 One of the endemic problem in Africa is that the education is very expensive for a local people and many of children have to walk for a long distance to go to school. 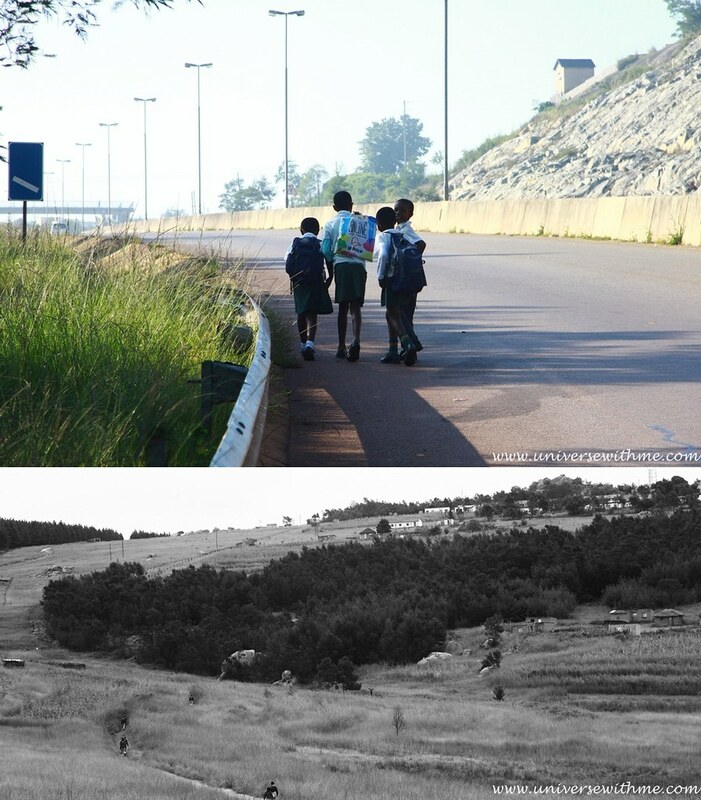 Some children walk on the highway and some of them walk on the forest for 5 to 10 km (3~6 mi) everyday. As I exhausted, Zoe came to and asked me “Are you okay? Do you need any help? If you want, you can take the rest at my house.” Thank to her, I could stay and be relax at heir house. 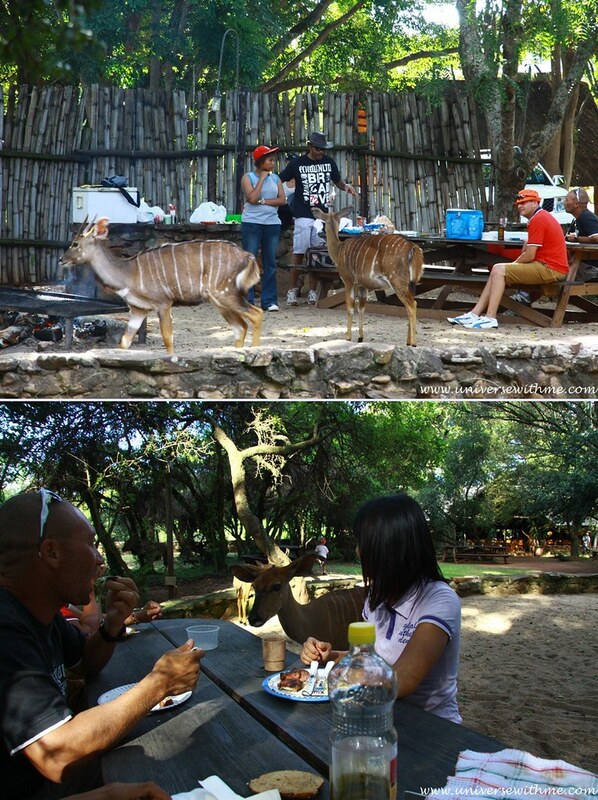 She and her friend took me Safari that I could do Safari tour again. Even I could get a chance to do volunteering at the place where she was helping. The house was quite clean and nice. There was small kitchen and toilet as well. I usually helped nurses. Patients usually cooked their food by themselves through their family. There were donated food on every Wednesday from local lady, Thursday and Saturday from local restaurant, Sunday from some church, and Monday from a meat company. I usually followed nurses who went round to see patients in the morning and I helped little things if they need. So, I could know about all patients well. I would like to introduced some of them here. There was not only HIV patient, but also other kind of patient. The lady on the first picture was 19 years old and suffered from epilepsy. Her family was very poor that she couldn’t be cared well when she was child. Last year she had hard time that she couldn’t walk anymore. But every day she had been getting better since she came here. Even she could walk again at that time! 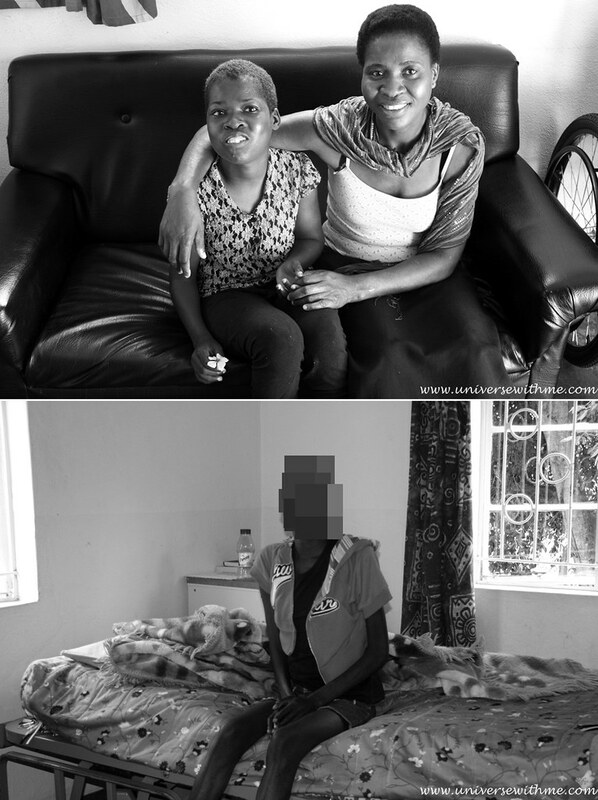 In the second picture, her body was getting worse since she got HIV in November 2012. Though her body was too weak to walk, she minded using wheelchair, because she didn’t like being treated as a weak person. Most of patients went back home after one to three months. 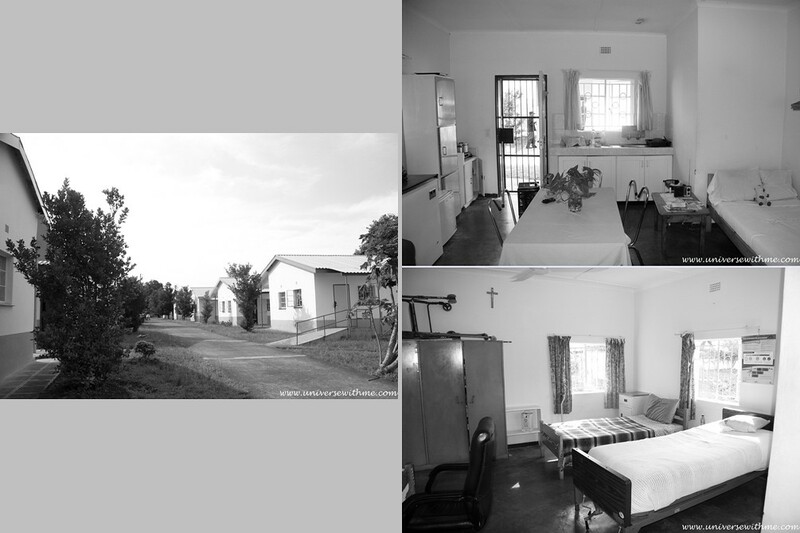 Some of patients got batter after staying here and some of them were not much different from first time when they came. Some of them died in Hope House. I studied and wrote about HIV/ADIS while volunteering there. I got chance to visit local volunteers meeting. Usually there were 30 orphans in this kind of building, and there were five local volunteers. On the picture they were kind of volunteers that they got 75 $ every three months. It was very impressive that local children were taken care by local volunteer, not by foreigner volunteer. One of the problem in Africa was the rate of unemployed was too high. So actually it could be better if the money which volunteer would pay for the flight to come here for short period is used for local volunteer. 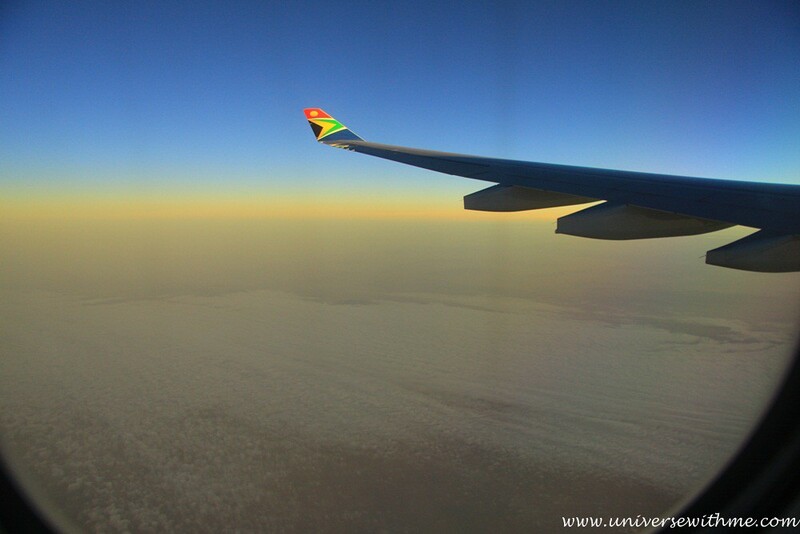 After Swaziland, I went back to South Africa and then went Botswana. Many people don’t know about Botswana because they don’t have much problem so they are not on international news often. Many of local people are proud of their country, because they think it is one of safe countries in Africca. One local people let me set up my tent at their house and she slept outside at the next to me. After crossing Botswana border, I felt itchy little bit. After a few days I felt itch all over. 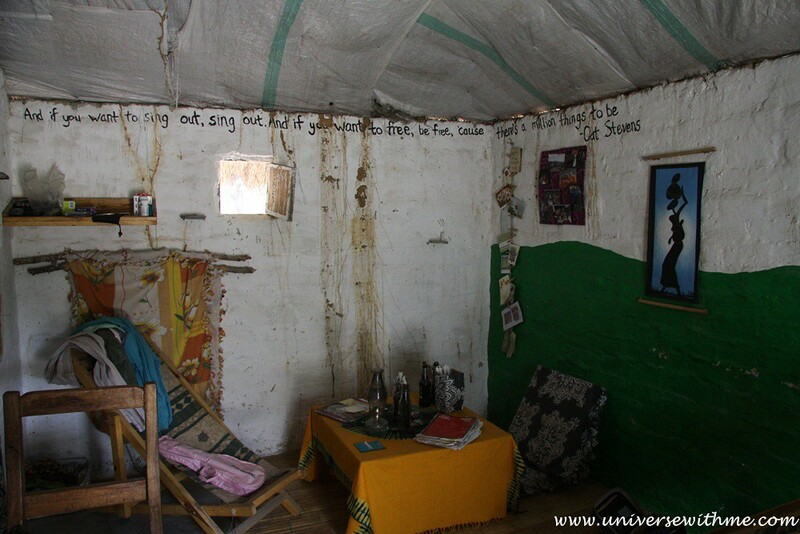 I slept at local people’s house at the day before crossing the border in South Africa, but it was really weird village. When I asked permission for setting tent at their yard, they asked me to show my passport and told me to go to a police station. Some of them said I should go to Chief’s house. He wore normal clothes, not like aboriginal clothes which TV showed. But he, his family, and neighborhood treated me like a criminal that they checked all my passport pages many times and asked me lots of question. Later they gave me permission, but they kept suggesting me to sleep inside. I wanted to pitch my tent, but I didn’t have a choice. Later I heard something that they called the police with their phone. I felt like local African people in South Africa was too conservative. There were so many tribes, so I could not say all of them was like this, but my experience was too weird. The worst part was that I was bitten by bed bugs at their bed. I almost bitten more than 300 places all my body. When I went out, people asked what happened on my body. Maybe bedbugs like a stranger only? Why they didn’t know about it? One Korean family let me stay at their house for a month. While staying I got a chance to volunteer through other people for a week. My job was helping a volunteer teacher at the kindergarten. I was a bit sad to see that children were too behind compared to other country children. They couldn’t write a number and alphabet well, because they lived in too small village. However, I was happy that I could help a teacher and I had good time with children. What was this? It was a huge advertisement. I though Swaziland needed it. But they didn’t have. Botswana had this one! It was a condom advertisement. In a bus terminal, the advertisement was really huge! 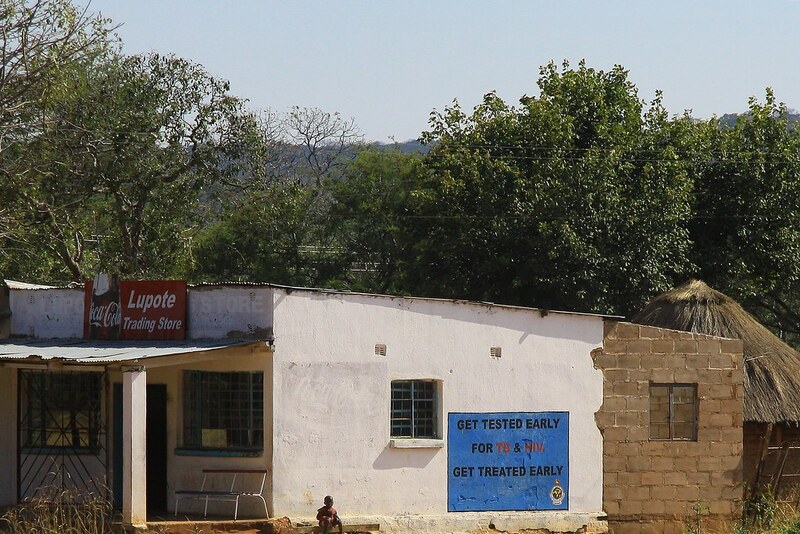 Swaziland was the number one for Aids/Hiv rate, and Botswana was the number two. 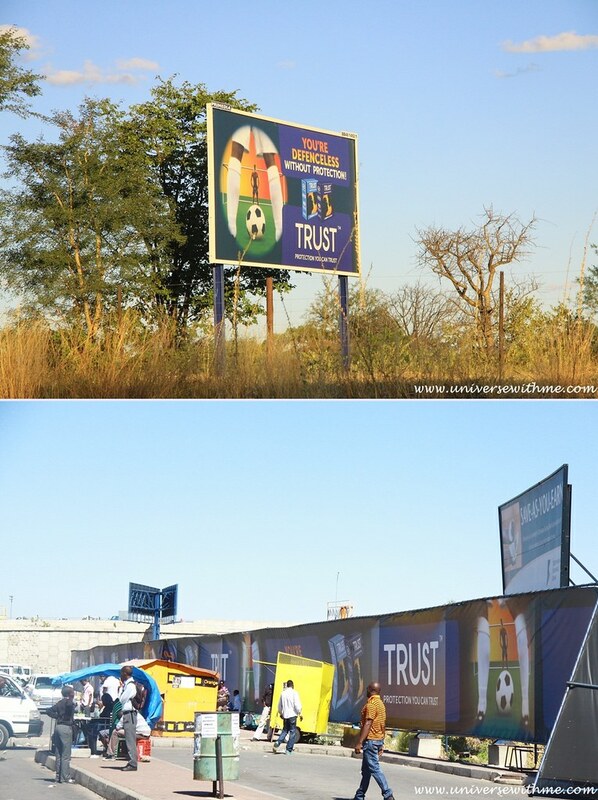 But it seemed that Botswana’s government tried their best to stop it. I was afraid of cycling in Zimbabwe, because there was a dictator, Mugabe, who was the president over 35 years and the rate of unemployed was 90%. When I asked for the tent to local people, they didn’t allow me because of safety. So, all the time I set up my tent at the police station. 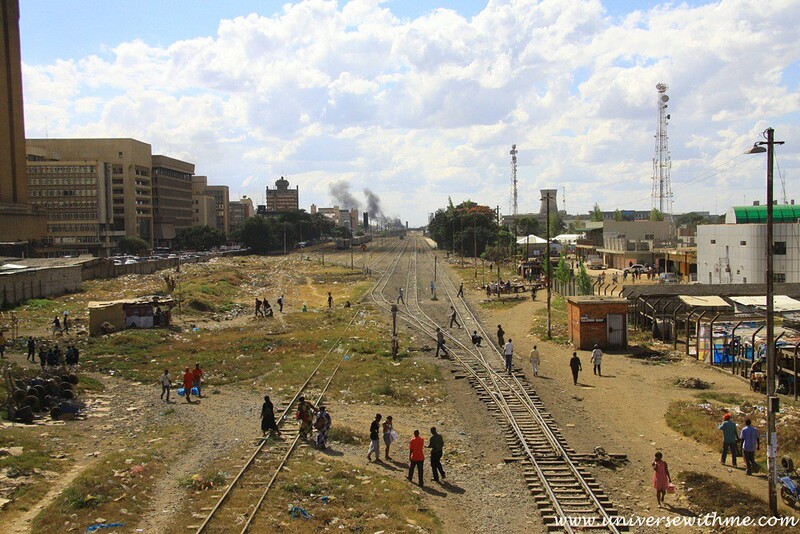 Above the picture was take in Bulawayo which was the second largest city in Zimbabwe. The city didn’t look bad. There was hyperinflation in Zimbabwe that people had to carry a big basket to carry money when they needed to buy bread. But now days they used U.S dollar and it didn’t look expensive to buy food. Once I was out of city, there were many traditional houses. I saw some painting at small grocery in a village. 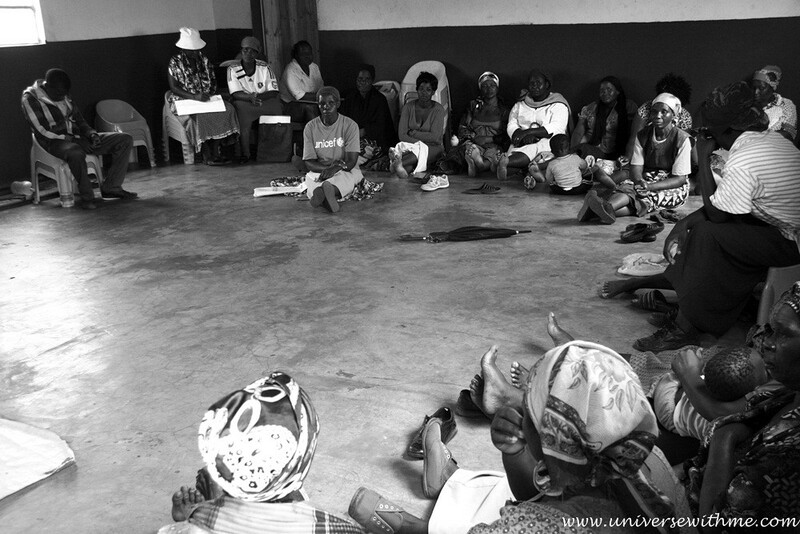 Tuberculosis (TB) and HIV have a deadly relationship; each drives the progress of the other. Infection with HIV suppresses the immune system, making it difficult for the body to control TB bacteria. As a result, people with HIV are many times more likely to get TB and to progress from latent to active disease than are people who aren’t HIV-positive. Unlike my expectation, people were more gentle than other countries in Zimbabwe. Many of them didn’t shout at me, but just waved. I got lots of harassing and flirting while cycling in Africa. The least harassing I got was in Zimbabwe in my memory. The picture was taken when I bought fruit on the street. I saw some weird thing while I was staying at police officer’s house for a night. There was exorcising evil spirits on TV, which I’ve never seen before. During watching it, she told me she wanted to send her husband there, because her husband liked girls too much. The Caucasian African girl whom I’ve met told me that she was leading a fast life. After went that place in Nigeria, she became different person. I had stomachache time to time in Americas, so I was afraid of trying local food. But I decided to try at some moment. She brought a chicken which was playing on the ground to the corner. I didn’t look at it, because it seemed she would kill it. After a few minutes she was back with a dead chicken and put it to the pot. After another few minutes another girl took a chicken out from a pot and pulls out feathers of chicken in front of me who was eating. By the way I was very hungry that I ate well. Then the owner put more soup and vegetable on my plate. 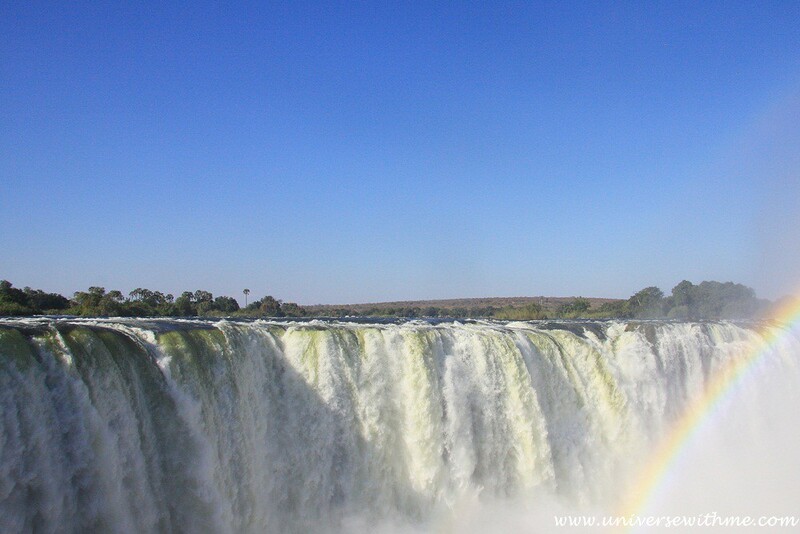 There were three world’s greatest waterfalls; Iguassu Falls between Brazil and Argentina. Niagara Falls between the U.S and Canada. Victoria Falls between Zimbabwe and Zambia. I’ve been Niagara Falls while traveling by hitchhiking in Canada and I’ve been Victoria Falls while traveling by a bicycle. And here finally it was time to see the last one. But as going far, I couldn’t see clearly falls, because the spray obscured. I thought May was not the best season. Maybe July would be the best which would be not raining season. Anyway I loved to hear the sound of the water falling. It was just fantastic. I was wet when I toured Iguassu Falls in Brazil and Argentina. So this time I prepared an umbrella and a poncho. The umbrella was the best one to protect camera during taking photos. While going back to the place I stayed, I saw an elephant which was too far from the main road that it was hard to take the picture. I’ve heard that there were many wild animals around the falls. 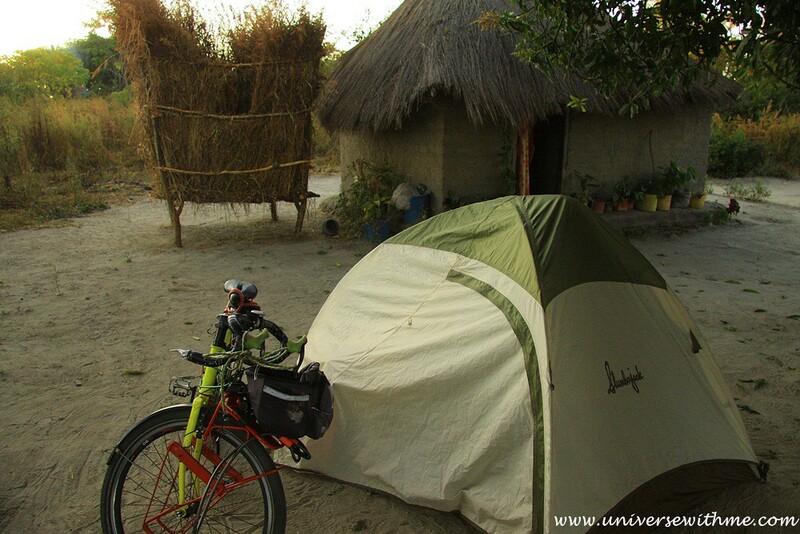 After touring Victoria Falls, I started to cycle in Zambia. Zambia had more population than neighborhood. So it was quite easy to find villages for sleeping place. 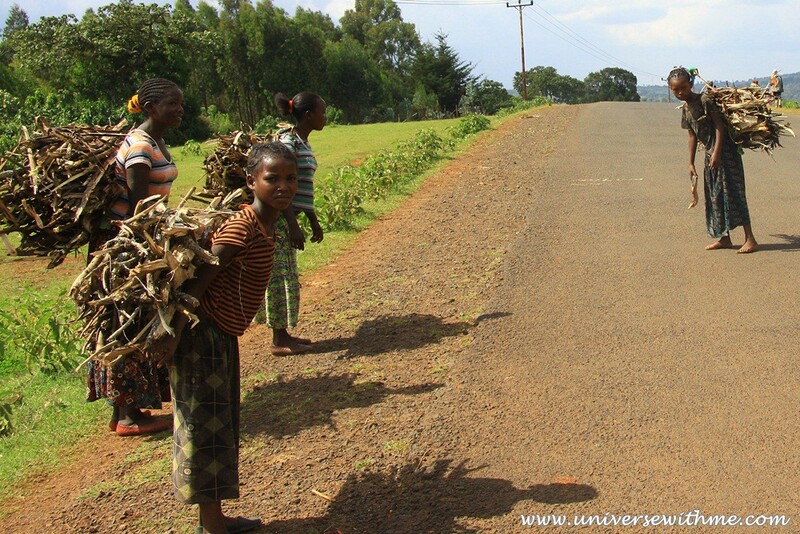 I could see many people selling charcoal on the highway. 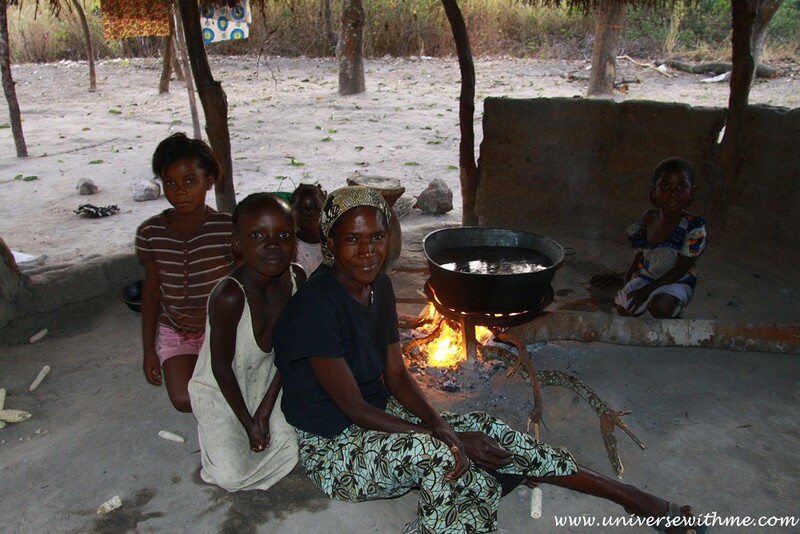 The next country, Malawi had the problem that people cut tree and made charcoal too much. Unfortunately now days the nature was destroyed too much there. But the thing was they were too poor to stop it. That big one was only 10$ that it was much cheaper than a big market. I felt like I could never compare my bike to them. It looked like really hard to live in Africa for them. The capital of Zambia was crowded with people and cars. My camera lens was really weird because there was some white blur on the center of the picture. On the street, I found secondhand lens exactly I needed with cheap price. But then I hesitated to buy because I did know it was stolen one for sure. I could lie to people, but I could not lie to myself. I didn’t want to negotiate with wrong person. So, I gave up buying. Instead of buying, I was looking for fixing. One local people showed me some photo store on the street. When I entered there, I was very excited because the owner was Korean. He told me there was mold in the lens. Although I couldn’t fix my lens, I could have Korean food with him. When I talked about volunteering, he told me there was Korean Missionary who might give me a volunteer job in a hospital. I expected old hospital, for it was at the out of city. But it was good and clean. Also there were enough workers. The hospital was built three years ago. Korean Missionary married couple came here twenty years ago. 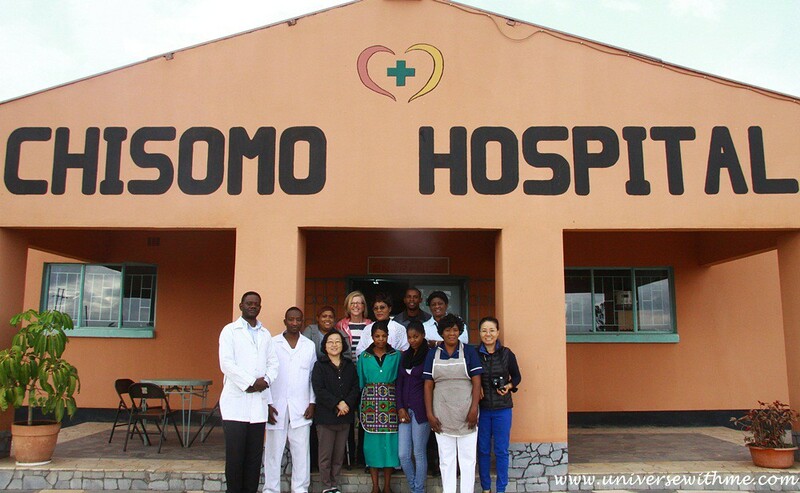 They worked on a mobile hospital, but then they found a big Korean sponsor in Botswana. That’s who they had the hospital. I usually helped Jeon in the office. Although I didn’t have religion, I was happy to be with them. It was only three weeks, so I felt a bit sorry to stay only short period. On the other hand, I felt thankful to spend time here together. One interesting thing was that every Friday women were waiting line to have contraception injection. At the out of city, there were many children in one family. But in the city, some of them tried to have a family plan. After long break, I started to cycle again. The lady who let me set up tent for a night had four children. She went a high school when she was a teenager. Unfortunately there was no supporter who could send her to school that she dropped school at grade ten. She spoke English really well, and she could speak two local languages more. Sadly, her husband died two years ago. She guided me to the highway at the next morning. I gave her small money and some gift which would not make her uncomfortable. During walking together, I asked her that how her life was. Some studies have said that developing country people are happier than developed country people. I am wondering which is true. I think the some of developing country people don’t have the word of “Happy” on their dictionary. So, when surveyors come to them and ask “are you happy?” they might just laugh, because they don’t know exactly what happy means. And then surveyors write down that “they are very happy.” And all of us believe that developing country people are happier than us. But the thing is that husband and wife die, the relative and family is suffering from HIV/AIDS, children don’t have enough food so they are wandering the road, the government is too corrupt, under the corrupt government people have to pay much money to go to school that many of them give up going to school, and some of them who have more money give poor people only small money. Then can we take their smiling as happiness??? Everybody knows one of poorest country, Bhutan, as Happiest country in the world because Gross National Happiness is high there. But GNH (Gross National Happiness) was made by Bhutan’s king in 1972. Bhutan is a closed country that everything is under government’s control. We never heard from Bhutan people how real thing there is. We know only what their government says. So can we say the poorest people is the happiest people? I cannot understand easily why some people envy poorer country people, and why they think to travel poorer countries is more worth, and why they think poorer people’s smile is only real smile. Africa had still culture of the large family. Usually when I found one house, I could see a few more houses around there. This was a bathroom. A toilet was separated. The bathroom was surrounded with straws. It was like a way of labyrinth, but didn’t have a door. I hoped nobody came to the bathroom while I was taking shower. There was wood and sack on the floor. 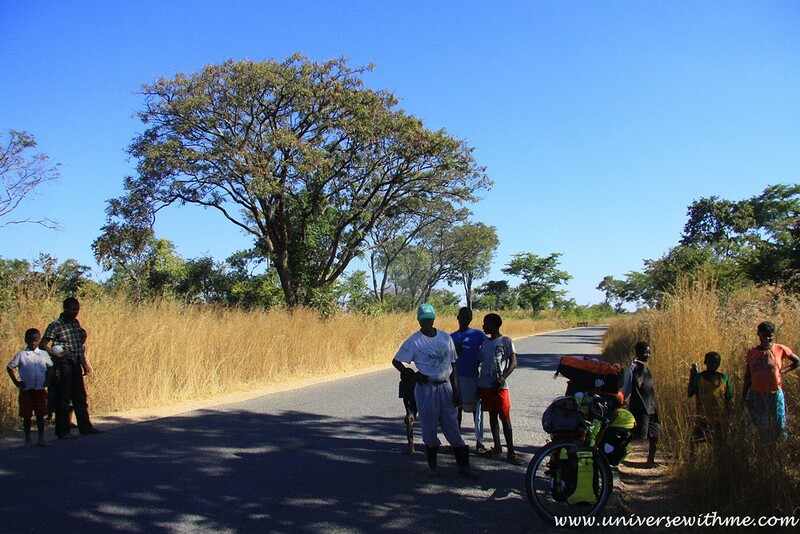 When I cycled in Zambia, the season was changing from the fall to the winter. It was hot in a day time, but it was extremely challenging to take the shower with cold water in the night because of coldness. 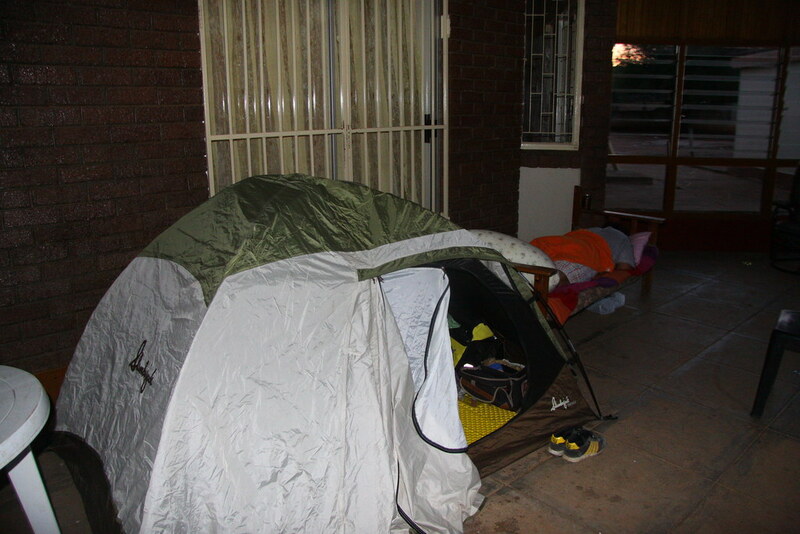 I had only three season tent and sleeping bag that I had to fight with cold in the midnight sometimes. Who would expect that I would have hard time with cold in Africa! 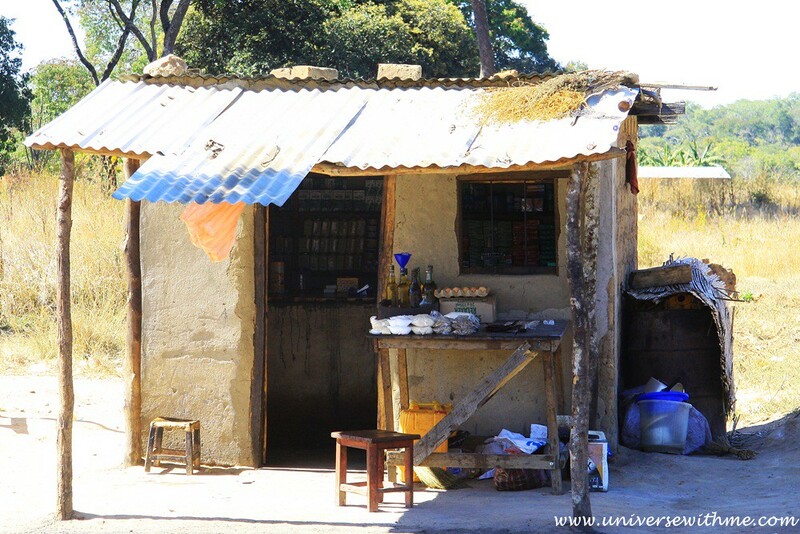 It was a local Zambian kitchen. 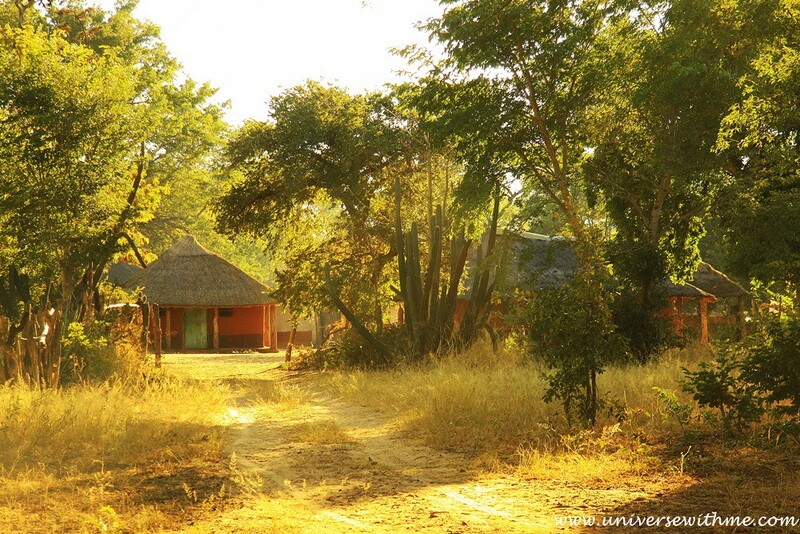 I had set up tent at a village usually that I figured out the Zambian traditional house. 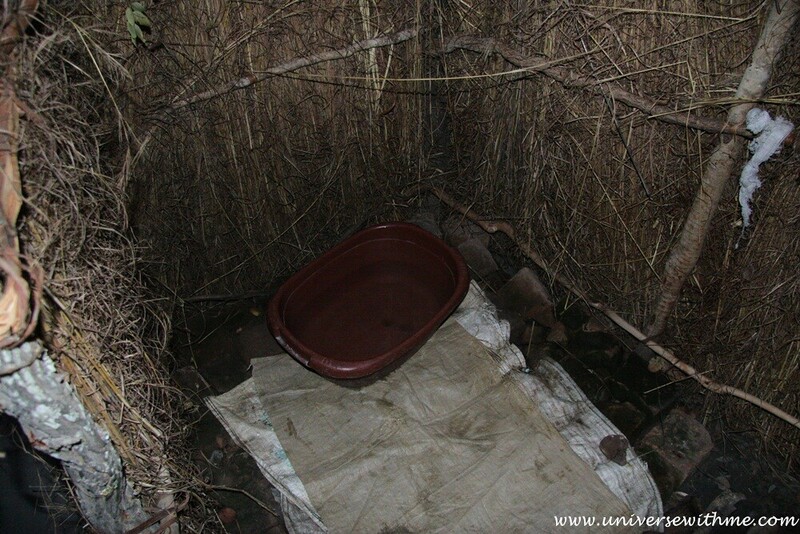 It was separated by five areas which were a sleeping place, kitchen, bathroom, toilet and silo for corns. Also there were a few relative houses around one house. 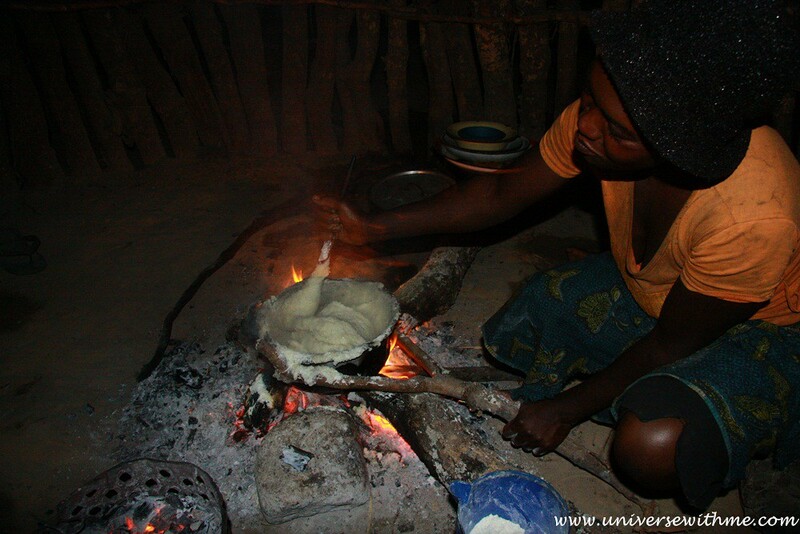 She on the photo was cooking nshima which was made of corn flour. She was one year older than me, but she had already three babies. 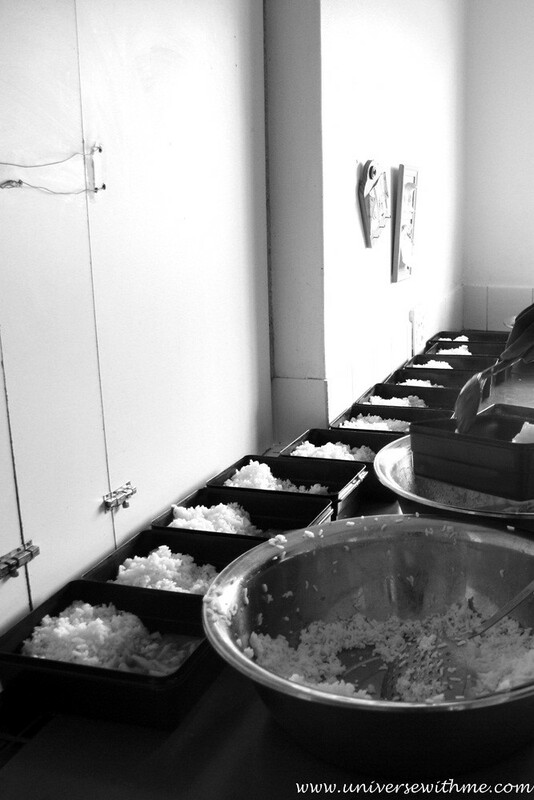 When nshima was watery, she stirred it and put more corn flour. Wood grip was creative thing. 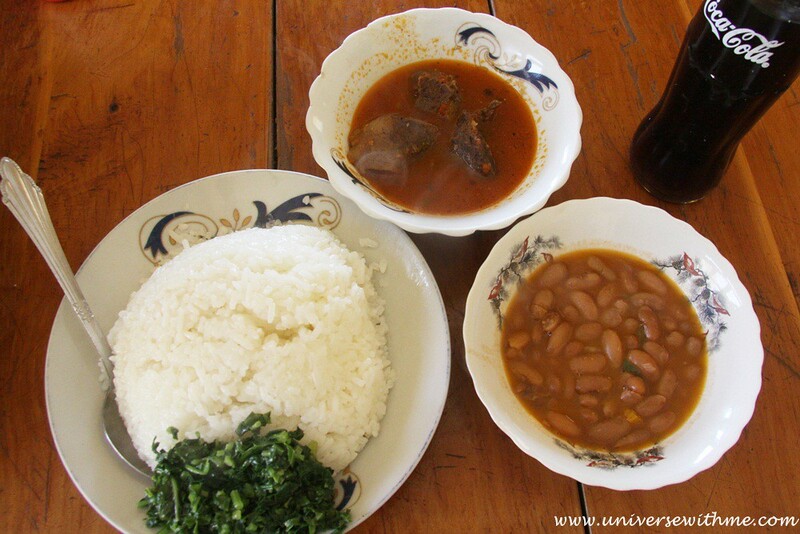 We ate nshima and beans with hands, but before eating we washed hands with hot water. (Without soap). They said all of thing is from their farm. I read some African book at that time and there was some interesting word. 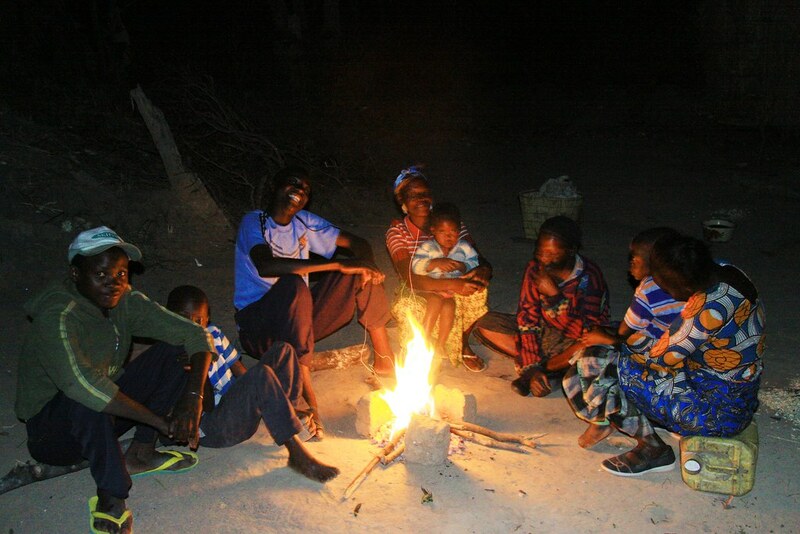 Usually in the night, they made fire and talked and ate together. Around 8 pm everybody went to the bed. People was not against the sun’s schedule. I read from something that people having insomnia could be cured if they lived in the forest or nature place where no light is for some period. It was a small supermarket in a village. I wanted to say it was actually not bad one. If it was really bad one, then it would be almost empty. While looking for buying something to eat, I met very special person, Lauren. She was Peace Corps which was a volunteer from the government of the U.S. She had lived in a small village over one year. She invited me to her house for a night. I was shocked how she, who used to have city life, could live in the bush for a long time. Her house didn’t have electronic and any other city life’s comfortable thing. She had a small sun panel light for the night. Once a week she charged her electronic stuff in a village. When I took the rest, usually local people started coming to me. 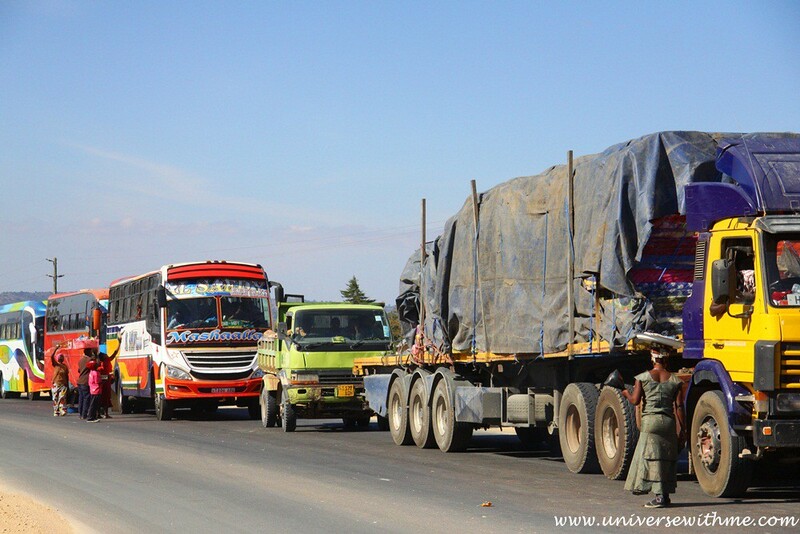 To cross Tanzania, the next country, was very confusing. Suddenly too many people talked to me on the border and I was nervous. I felt like many of them wanted to cheat me. 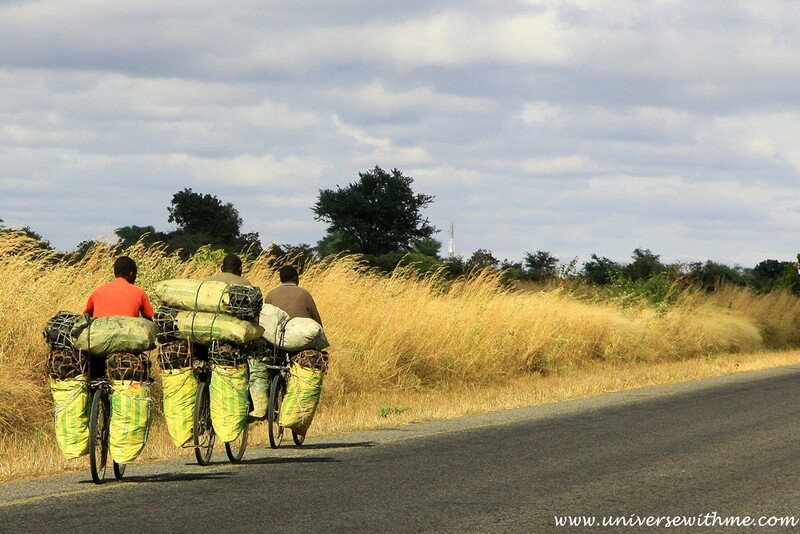 While cycling in Tanzania, I felt Tanzania was more richer than Zambia. I could see motor cycle and cars more often. When I was looking for a place to set up my tent, I found a house at a small road beside a highway. The family let me set up my tent at their yard. One of sons in the house tried saying Korean greeting. Even he could tell me other Korean words. How come African knew Korean language? He said he studied English in a university which was located at the capital. At that time, he learned Korean from Korean professor. It was really good time with him that I taught some other Korean to him in the night. 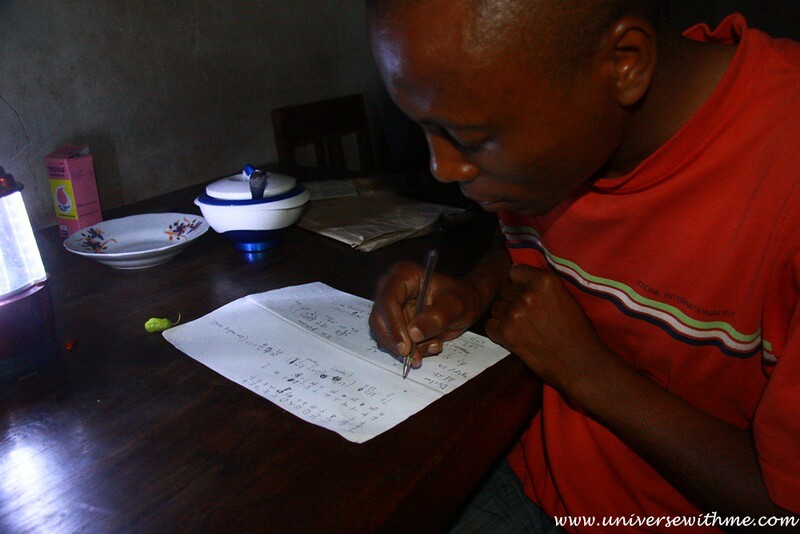 The house didn’t have electricity that we used lantern for studying Korean. I was wondering how he could have cell phone. He said he charged in other village for 24 cents every two days. Also he had to buy batteries for lantern once a week. I hope they could electricity from the government in the future. 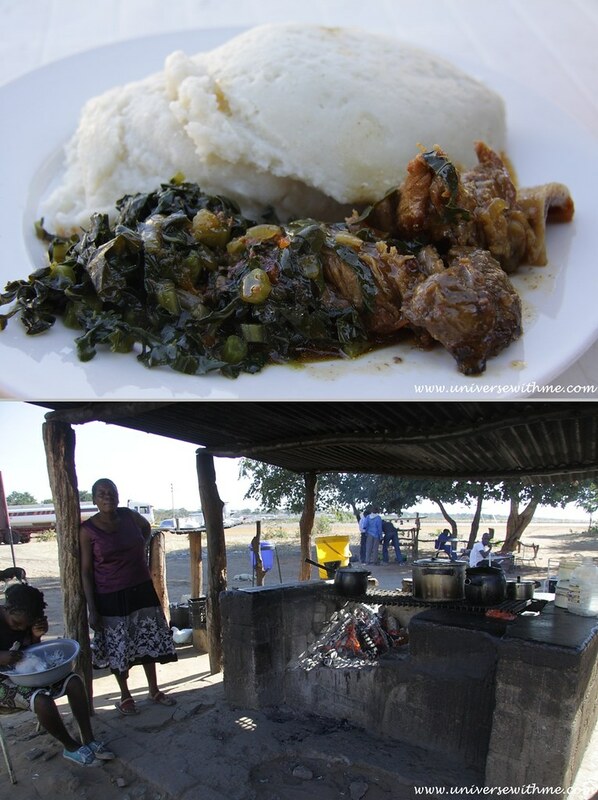 Usually a meal was around three or four dollars in Zambia. But in Tanzania, it was only one or two dollars. I thought Zambia had some problem that prices were too high compared to their salary. The lunch on the picture was for $ 1.6 including cola. Some road was under the construction that many cars waited to pass. Many street vendors tried selling something on that place. I bought grapes. While traveling in Africa, I read Dark Star Safari by Paul Theroux. I could not agree that he belittled other travelers as calling a tourist. It doesn’t matter how travel is hard. We all are just tourist to local people. Except that part which he disregarded other travelers, I did agree about his thought at Africa. To read his book was like I was chatting with a good friend because what he saw and felt was what I saw and felt in Africa. Usually the stories of Africa in other books and blogs don’t show real African face. Paul’s book explains real Africa exactly. It is too bitter. He said 40 years ago Africa was too poor. There have been many helps from NGO and Aid for decades, but why it is still poor, he asked with skepticism. But I guess we should realize we who aren’t born in Africa can’t change Africa. The only person who can change Africa is African. But the way African think is different from us that it is really difficult to change. Maybe I know one way to stop African’s hunger. To fix dictatorship and corrupt government could be the best way to change Africa better. But nobody can do it. Many people tried and were killed. Also, all developed countries are same team with corrupted African country. We can’t change it easily. I actually get one idea while writing about Epic Africa post. Charity can never change Africa. But to invest with pure purpose can change Africa. Instead of charity, to have business or invest local business, hire only local people, try to make money with them, and give workers most of money would be much better. Most important part is investor only take same money as what local workers take. Investor should not be greedy at money, but sharing money. I think we are told by TV that we have to do charity at Africa and we feel like angel after helping them. Actually it could be not angel thing, because it makes them too dependent and feel loser. To invest would not give this angel feeling. But actually to invest Africa with the way I suggest could be real angel thing because it is real way to share. Even it can change Africa. The rare tire was worn out that I could see blue color which should be not seen. So I moved the rare tire to the front. I hoped I could survive with worn out tire in Africa. I had seen Baobab tree in Zimbabwe. But this area had more baobab trees. It was gorgeous to see big baobab trees. A car passing baobab tree looked small compared huge baobab tree. There was one highway road which passed the middle of Safari. I must pass there to move to the next city. I couldn’t sleep longer in the night because I was too nervous. 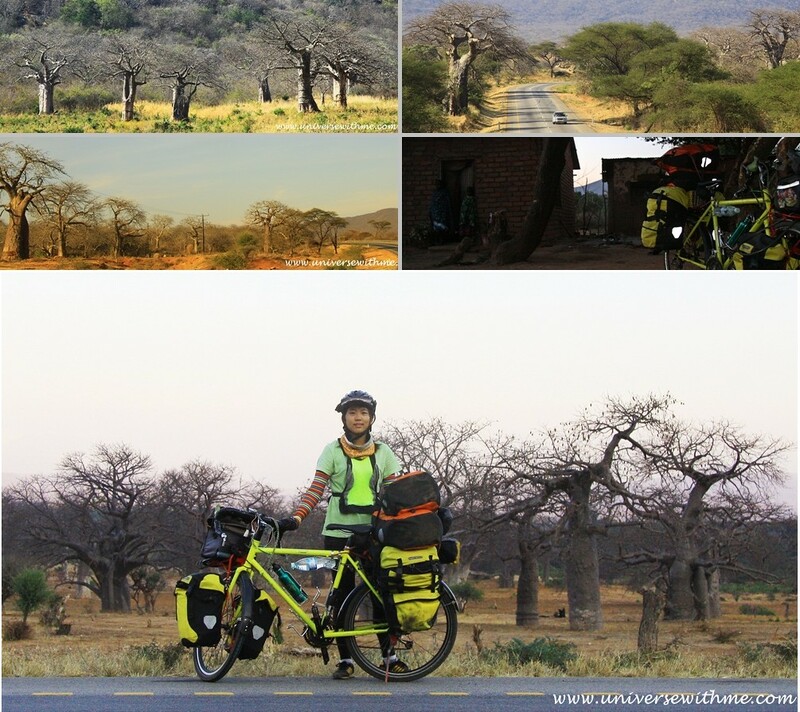 I had to cycle in Safari where lots of animals were such as a lion, hyena, leopard and more. I asked information center and people. They told me that usually a lion didn’t come to the main road. But never knew what would happen in the life. Once I got there, actually I was very excited that I could see lots of wild animal besides the main road such as black wild beest, giraffe, impala, buffalo , elephant, warthog, and zebra. There was one horrible thing. Tsetse flies, large biting flies, bite me although I cover all my body with clothes. I had got bitten every three minute. It was terribly hurt as if I was bitten by bee. After getting out of Safari, there was no more tsetse fly. What a weird. I thought it is because of wild animal. I set up tent at the school in that night. I asked English teacher that on the road people who wore red fabric were Masai. He said yes. I said that they looked too scared. He said they were not dangerous guy that I didn’t need to be scared about them. He even introduced me Masai village which was at the back of school. 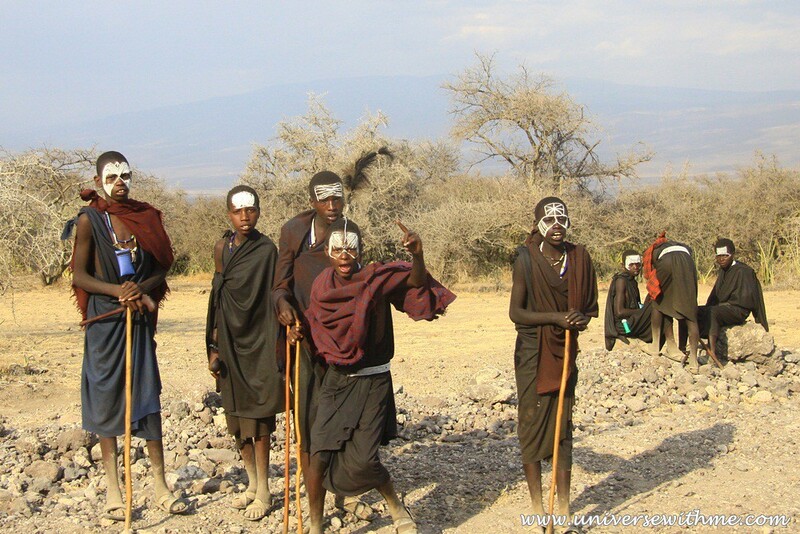 Thank to the teacher, I got the chance to meet Masai people and look around their houses. 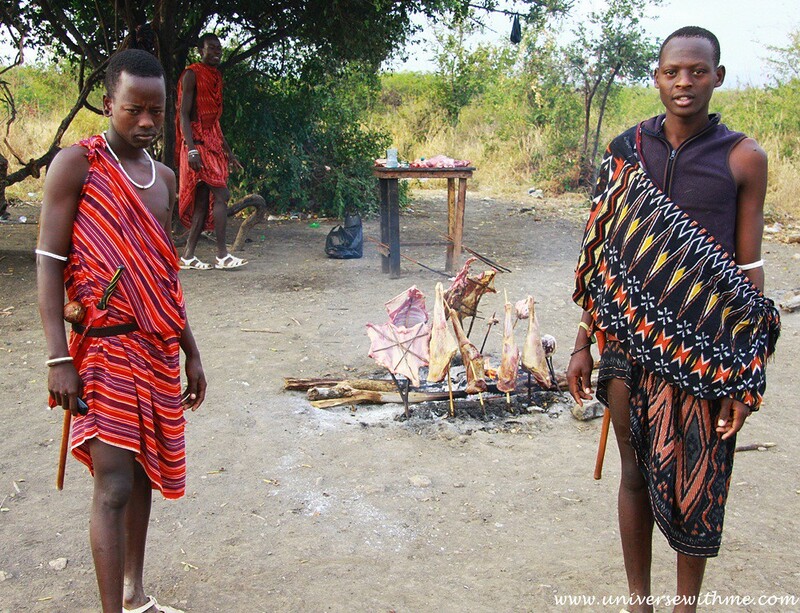 At the next day, I saw some of Masai selling beef on the street. I asked them to take picture and they asked me money. I gave them small money and took the picture. But one of them made a face. 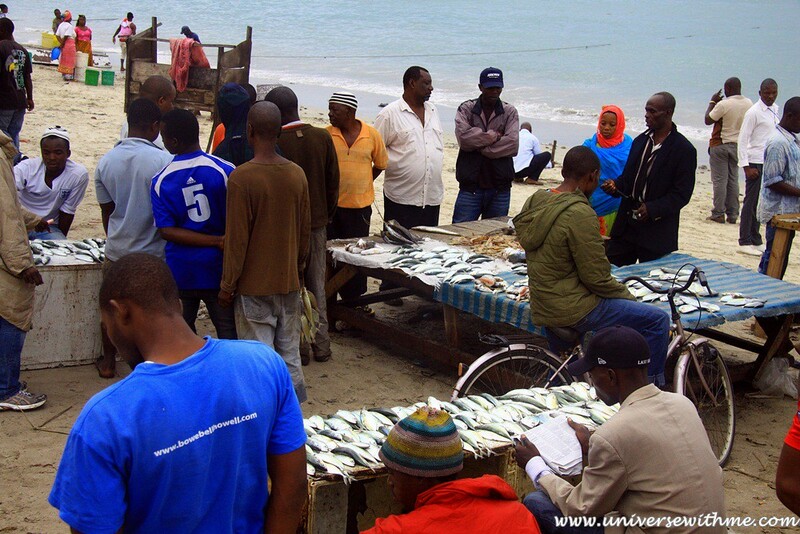 I went to Zanzibar which was one of famous tourist attraction by ferry and stayed there over week. One of beautiful thing was rabbit warren. I met friends whom I met last week that we hanged out together in Island for a few days. I really enjoyed hanging together. 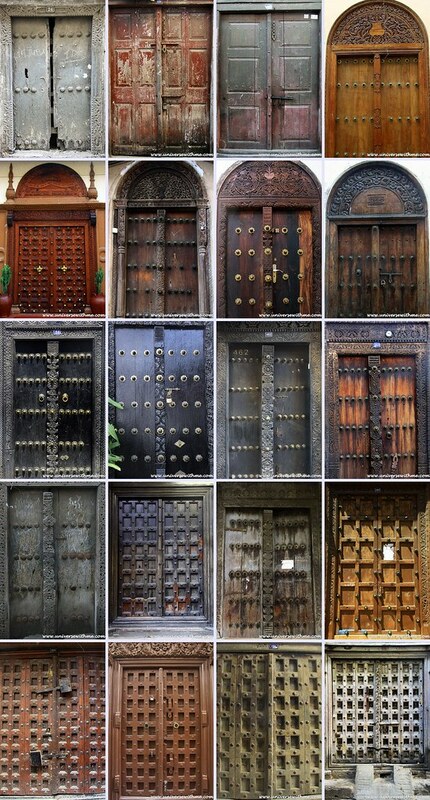 Zanzibar had very special doors. I went to the north with my bike to enjoy a beautiful beach. I could see people making a boat and net by hand there. Zanzibar was colonized Portugal, Oman and England. During Oman’s colonizing, most of them were changed to Muslim. 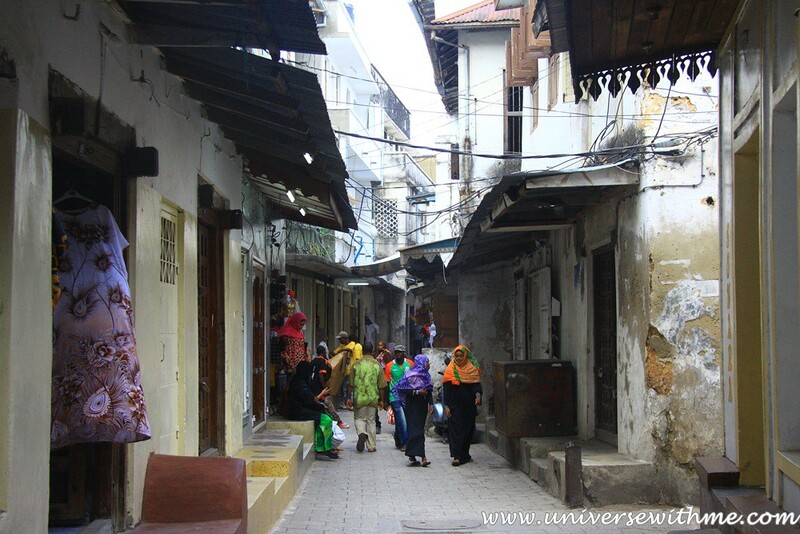 So more than 90% of people in Zanzibar is Muslim. 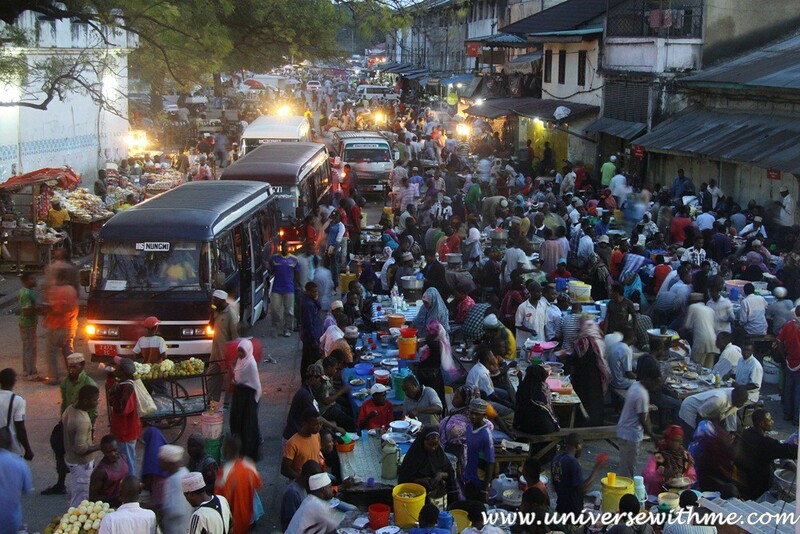 When I was there, it was Ramadan which meant fasting from 6 am to 6:30 pm for Muslim for one month. They tried to prohibit even none Muslim people eating or drinking on the public place. Only expensive tourist restaurant opened that I was doing kind of fasting, because I didn’t have choice. After sun goes down, people started eating. It was said during Ramadan it was the most profitable month a year for restaurant. Usually people went to bed very late during Ramadan. They sit on the street and chat with family and friend. It was very interesting to see their culture. 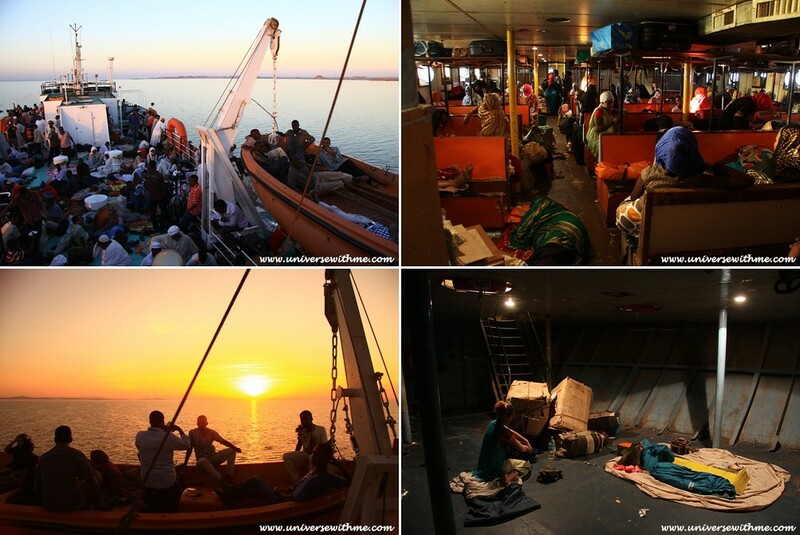 On the way I came back to the mainland, the ferry was like being in danger of shipwreck. It was really bad. I was lucky that I took some medicine for nausea before taking a ferry. Some of passengers kept vomiting in the midnight. After getting mainland, I passed some village people was selling fresh fish. I had seen wood bike many times around some area. African people were good at handicraft. One of things which made me feel difficult to cycle in Africa was that people surrounded me and watched me as like looking a monkey in zoo. It was too much attention everyday that I could not have my own free time usually. 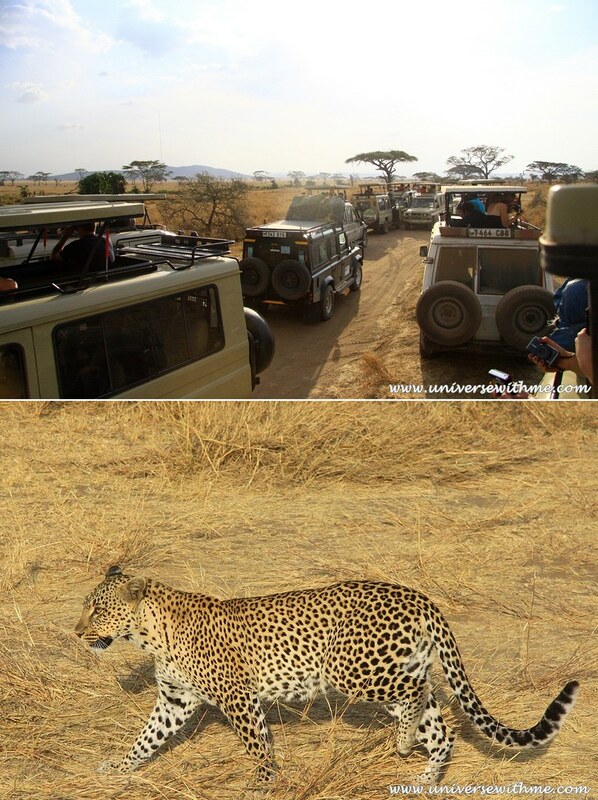 The most famous safari in Africca would be Serengeti in Tanzania and Masai Mara in Kenya. It was huge one land, but separated by the border. I went to Serengeti, but it was my mistake. 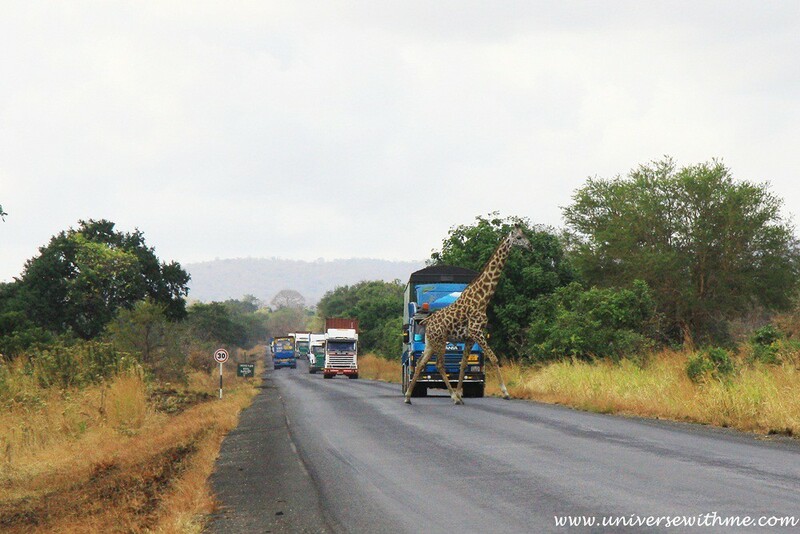 I should go Safari at Kenya side because the way to Serengeti from the city was too far and it took too much time. So, I didn’t have much time to spend in Safari. I paid $400 for three days tour. One thing I didn’t like was the tour agency was really bad and unkind. While going to Safari, I could see Masai. There was big five animal. The phrase big five game animals was coined by hunters and refers to the five most difficult animals in Africa to hunt on foot. If there was one of big 5 coming, then drivers used radio to each other and so many safari cars came like on the picture. Although it was short time, I could see many different kind of wild animals. We set up tent at camping site at the inside of Safari. They told that wild animal don’t like human so it would be safe to sleep. The last day we went Ngorongoro crater. I could see white-bearded Wildebeest herd moving in the morning. 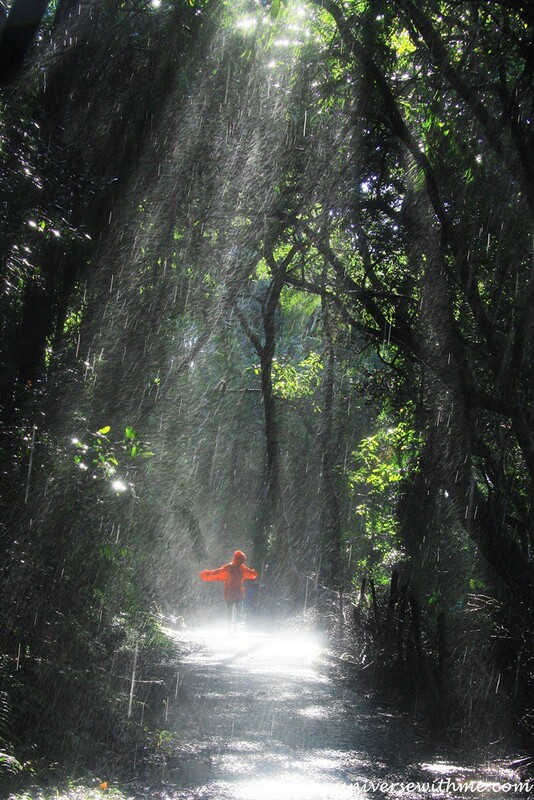 It was one of amazing scenery I’ve ever seen. 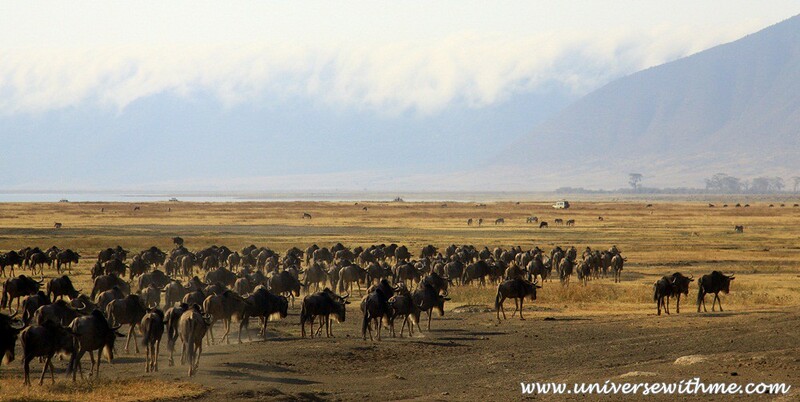 There were many animals at Ngorongoro, so we could see other animals as well. Kilimanjaro was the highest mountain in Africa that it was 5,895 m (19,340 ft) from sea level. But it was not the mountain I could climb. The reason was not my weakness, but money. The cheapest climbing cost was almost over 1,300 to 1,500 $ for five nights. I asked many local and foreigner companies for the sponsor, but I didn’t get any answer. I gave up with crying. I failed climbing high mountain in South America. So, as seeing high mountain, I felt some frustrating. I hoped one day I could climb one of high mountains and overcome my past failure. The next country was Kenya. 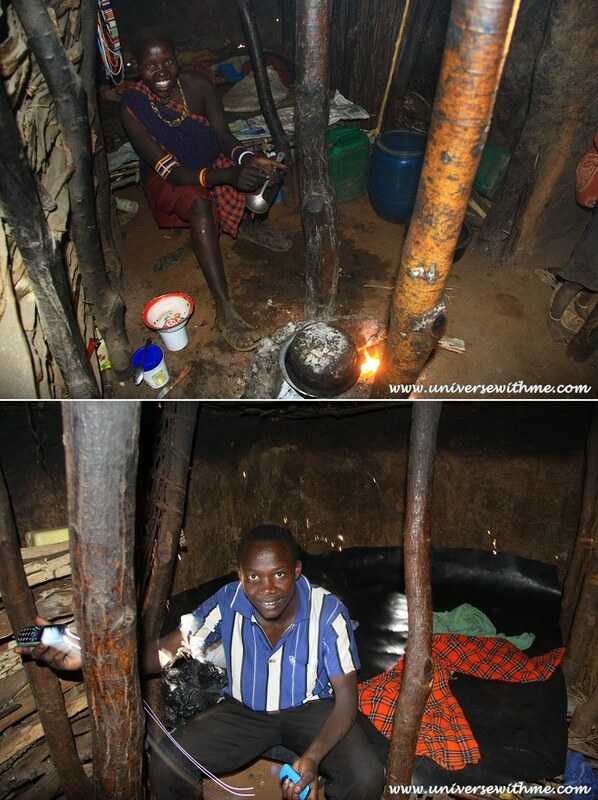 I got the chance to visit Masai house. Although their house was built with cowpat, they had a cell phone. Some of them couldn’t understand why I didn’t have a phone. Why did I need a phone??? The capital of Kenya was really complicating. Unfortunately, I got a car accident as arriving. There was difficult uphill, so I was taking the short break on a bicycle at the side. Then small mini bus hit my right side and I was thrown a bit, and my shoe and my bags were thrown far. I was sure that the driver was texting. I called the police and I got $50 after arguing with them. It was my third car accident in three years. But none of them apologize. Two of them run away and the other one was just angry at me. If he apologized from the beginning, I would not ask $50 for my broken bags. In Nairobi I stayed in Canadian friend house whom I had known in Yellowknife, Canada where I lived for nine months. At the day I left the capital, there was a terror in the nicest shopping mall. I heard about terror after few days later from local people. 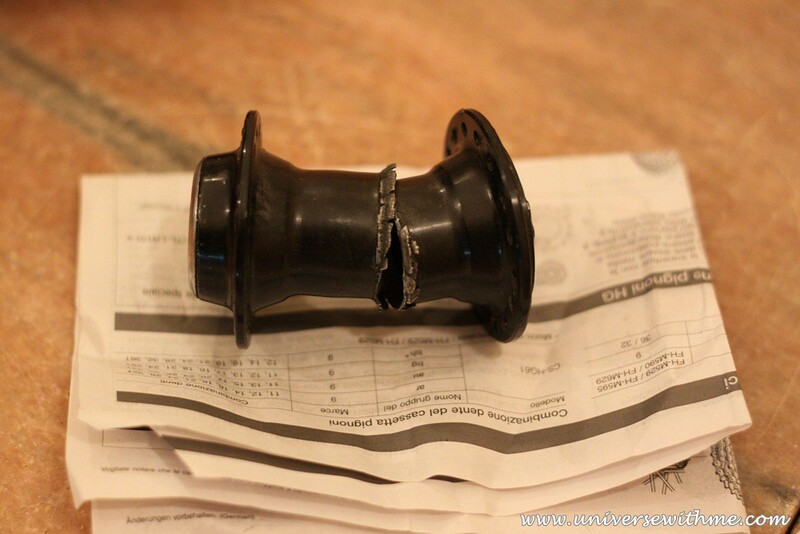 As I headed to the Northern Kenya, my derailleur was broken. I had never had such a big problem like this. I hitchhike to the next town, maybe 30 km (18.75 mi) to fix. The worker didn’t know how to fix well that it took much time. Northern Kenya was very dangerous because of civil war. So the next country, Ethiopia didn’t give overland visa. But since this year they started to give it. I didn’t want to test my luck that I just took the bus. 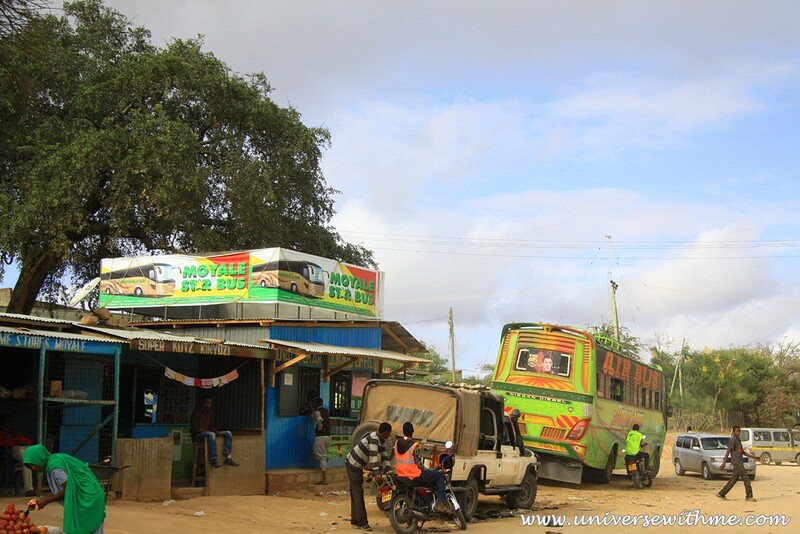 It was my first time to take a bus in Africa. The bus was the worst ever never ever in the earth. The road was too bumpy, but a driver never cared about it and drove so fast. I had been jumped out lots of time all night. I felt like my coccyx and neck would be broken.Even there was no washroom for 12 hours. Actually I took some medicine for carsickness just in case. At the end, it was the best choice. One little girl vomited all night in the car. I watched some movie about slave trade in Nairobi. It seemed like I was on that movie. It was like I was shipped as a slave. The bus was too dark, we were jumped a lot, there was not much space, people vomited, and so on. I expected that I would see a camel in Sudan or Egypt. So it was surprising to see it in Ethiopia on the road. I thought Ethiopia was the poorest country in Africa I’ve been. 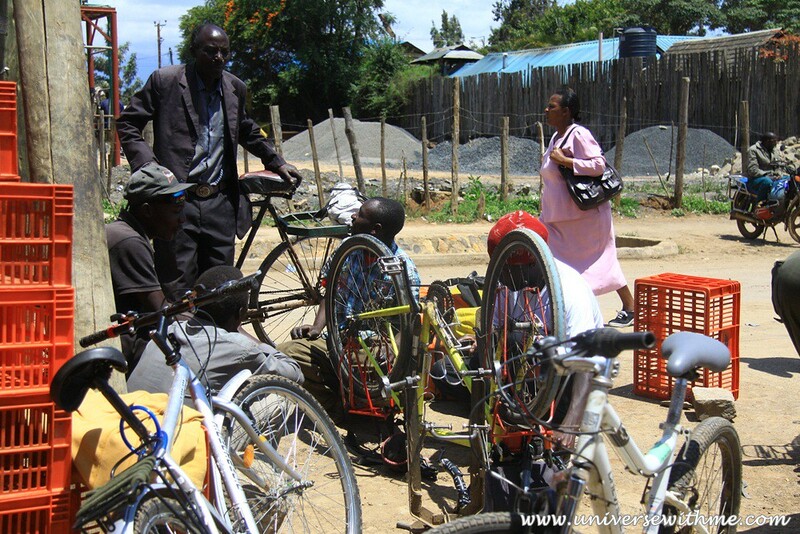 Ethiopia was known as difficult country to cyclists. There was no terror, but children threw stones sometimes and bothered. On the way to a big city, my chain didn’t work. Derailleur which I fixed in Kenya was broken again. It was impossible to cycle that I hitchhike. Truck driver and I had Ethiopian food together. Most of Ethiopian believed Orthodox that they didn’t eat meat on Wed and Fri. Ethiopian food was really interesting to me. I couldn’t find a part, so I went to another big city. The mechanic told me he could fix it. I waited two hours, but he kept struggling. I found another guy, and he put a new derailleur part. But it was not working well. I hoped I could use it at least until the capital. Then I would change all of them. It looked like some of Ethiopian life was much tough than other African country. Many young children carried wood. The most tragic thing I saw was that three years old boy carried water bucket in the rain. I cannot forget that rain day. 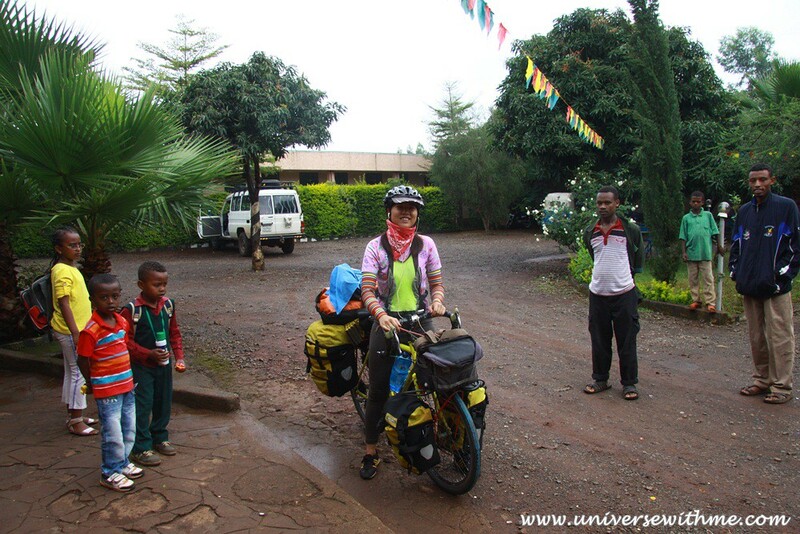 It was very stressful to cycle in Ethiopia that people and children shouted at me “YOU”, chased me, surrounded me and threw stone (a few times) at me. Just think about it. Thousands people are shouting at you every day on the road wherever you go. It was really difficult to have peaceful mind. It looked like it was raining season. Front tire was really worn out that I could see blue color clearly. Unfortunately rare derailleur was broken again that I had to hitchhike. I was not sure that I could find a good bicycle shop in the capital. The population of Ethiopia was eighty millions. But at the capital, there was no bicycle shop that I was very frustrated. I found warmshower host in the capital and I was supposed to stay for a few days. But then they told me they could help me. My host was Swiss diplomat that it was easy to order bicycle parts through her. Thank to their help, I could fix bicycle and change old gears. I stayed there for two weeks with them. When I had farewell, I felt too sad. 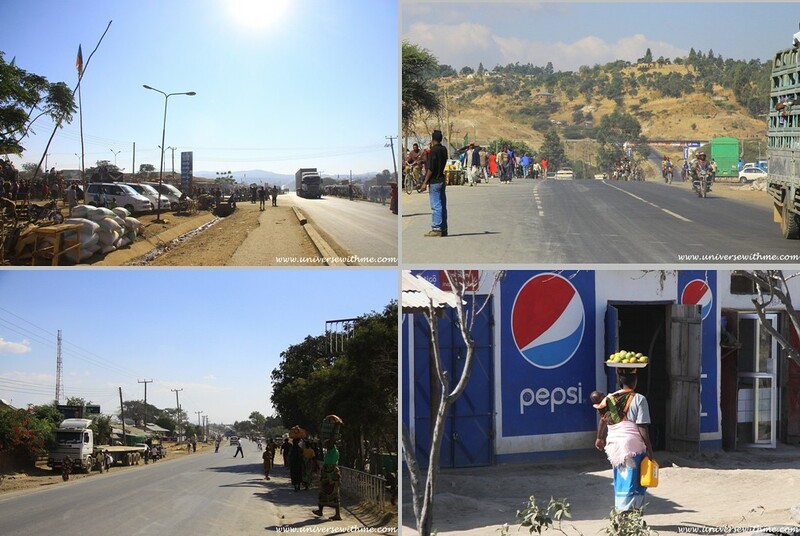 The picture was taken in the capital of Ethiopia. Always big cities in Africa was chaos. I had only one month Ethiopia visa. But visa started when I applied. 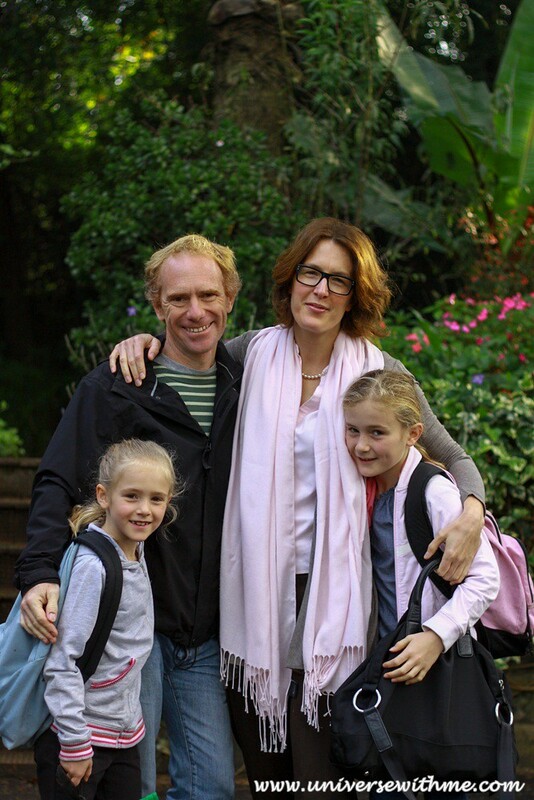 So I had only three weeks as I got to Ethiopia because one week was already gone in Kenya. I spent two weeks to fix my bicycle in the capital. I had only one week left to Sudanese border. I decided to cycle in the morning and hitchhike at the afternoon for a week because the border was 900 km (562 mi) far and it was very hilly. 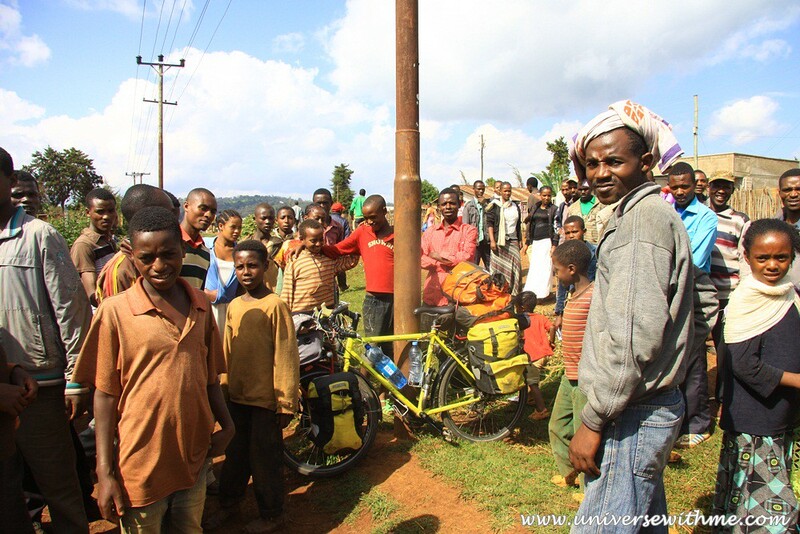 Although I got lots of stress on a bicycle because of being bothered by children and some local people, I really liked Ethiopia. They had their own culture that I enjoyed their food, music, coffee, and people’s hospitable. I couldn’t read their letter, so I chose food without knowing. But all the time I got different food that I felt amazing. 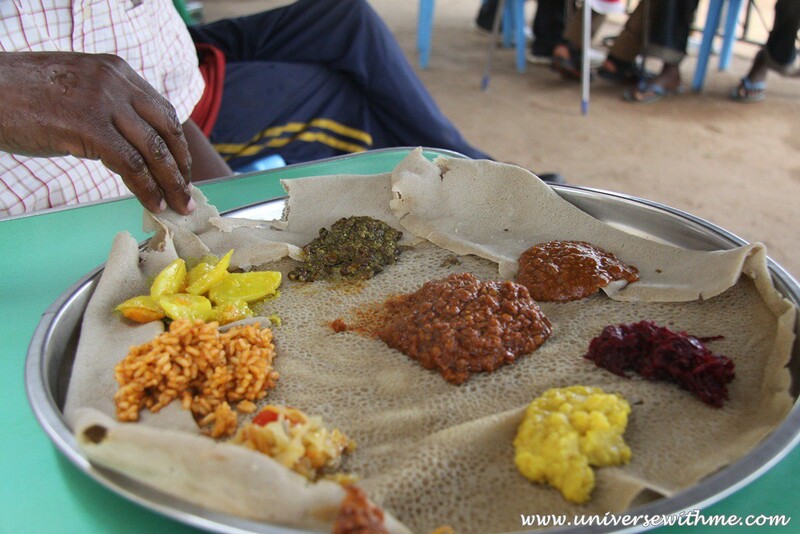 As a person who had much curiosity, I wanted to say Ethiopian food was most beautiful food in Africa. 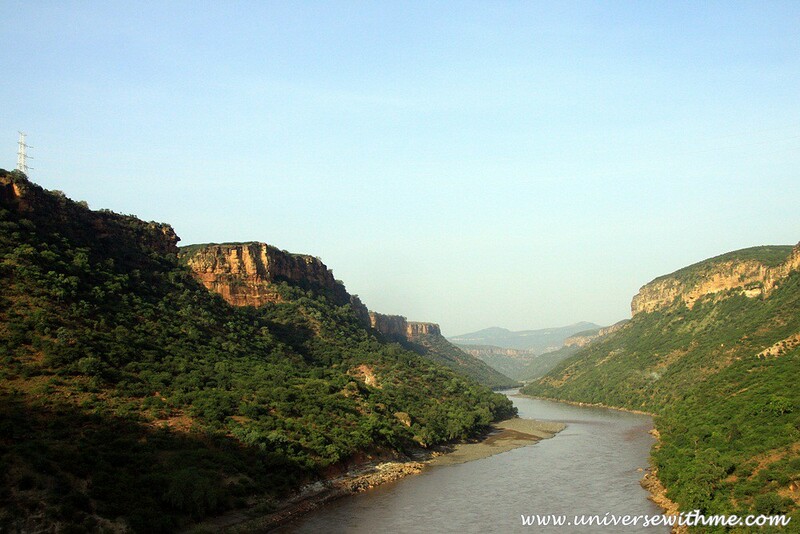 One of reason I liked Ethiopia was landscape was really pretty and beautiful. One of common thing in Africa was that there were many tribes in one country. So as I moved other area, I could see different culture. The way to wear clothes and greet was also different. I liked to see those things. The scenery was so beautiful and food was amazing that I really liked to cycle. But I had to hurry that I got a ride usually at the afternoon. 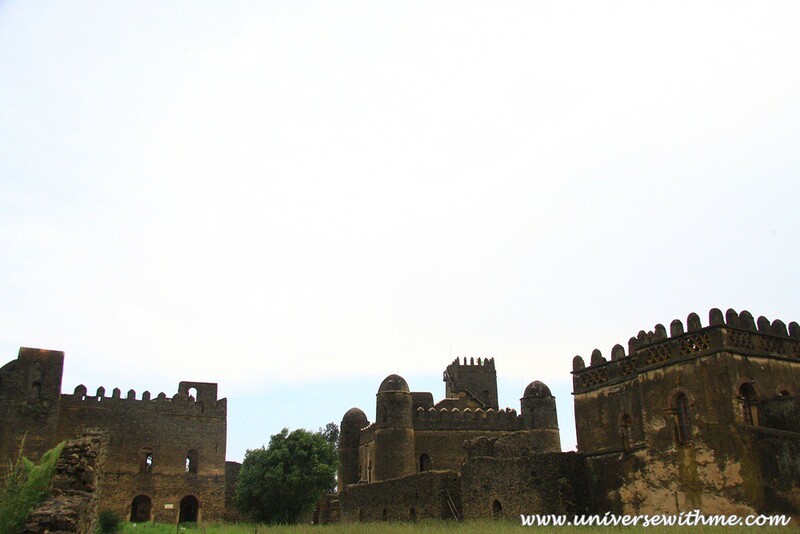 In Gondar, I toured castle. 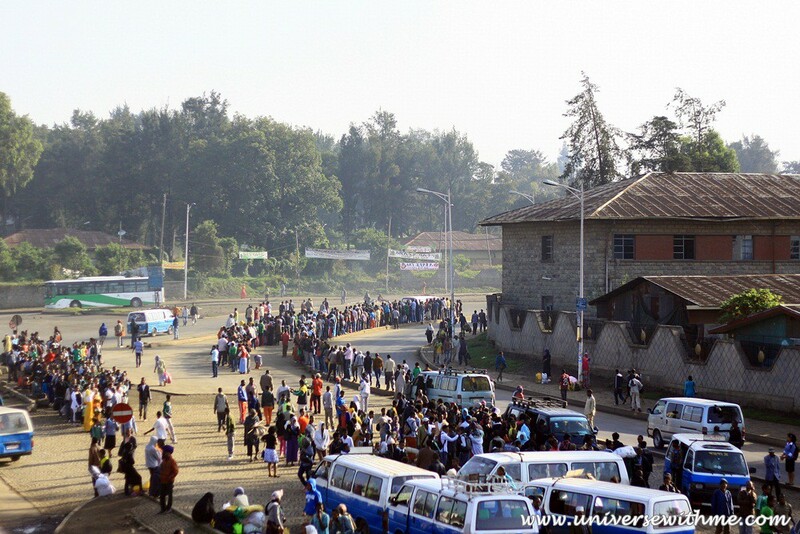 After Gondar, I must rush to the border. But it was very difficult to get a ride at the last day of my visa. The border close at 6 pm. If I was late 10 minutes, I had to go back to the capital and pay penalty. Sudan was separated by two piece because of religion. (North) Sudan was Islamic country and South Sudan was Christian country. It was extremely too hot that even I got a headache. 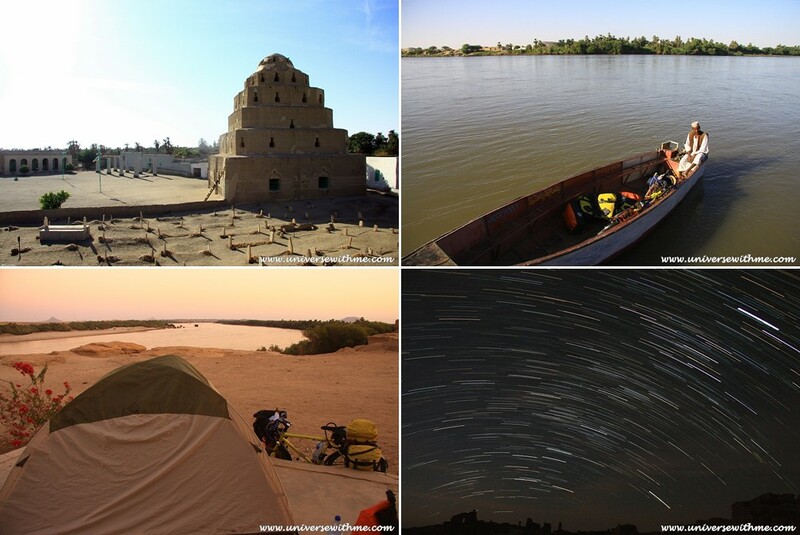 To cycle in Sudan was like to cycle in front of three hair driers. 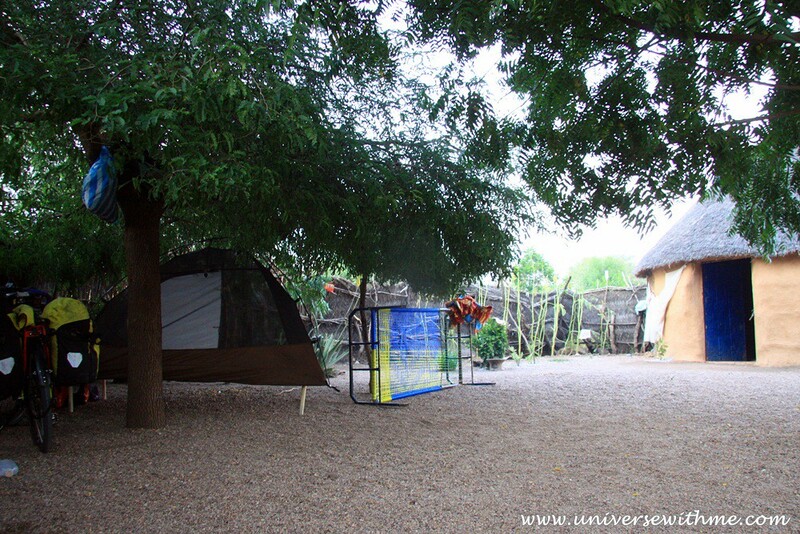 In Sudan people were hospitable that they let me set up my tent at their yard and provide me some net bed. Since I came to Sudan, the scenery was changed to the desert. 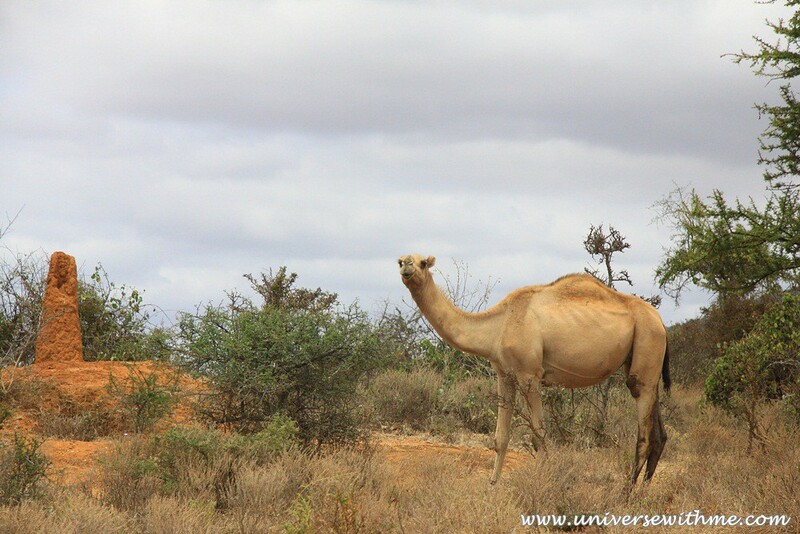 I could see camels often and sand beside the road. 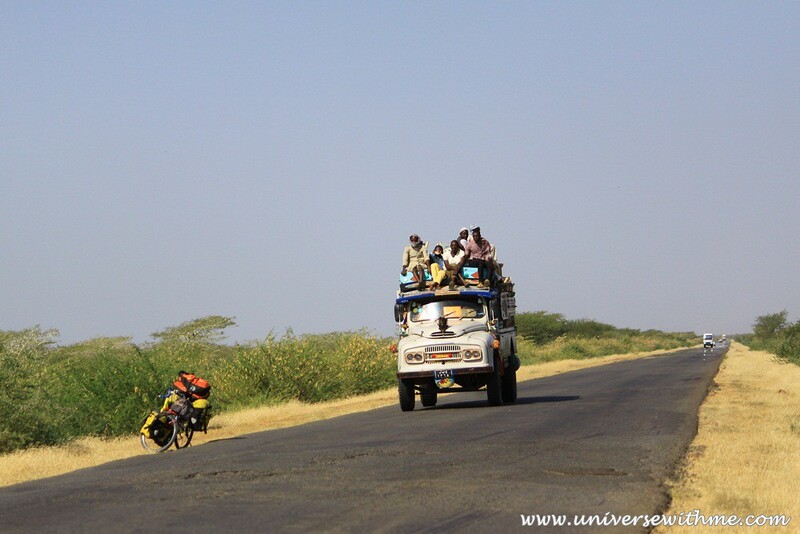 In Africa too much people tried to be in a car some times together like picture. One of difficult in Sudan was language barrier that most of traffic sign was in Arabic and people could not speak English. It was said that the government prohibited to teach English in the past. So my age people couldn’t speak English, but some old age people could speak English. 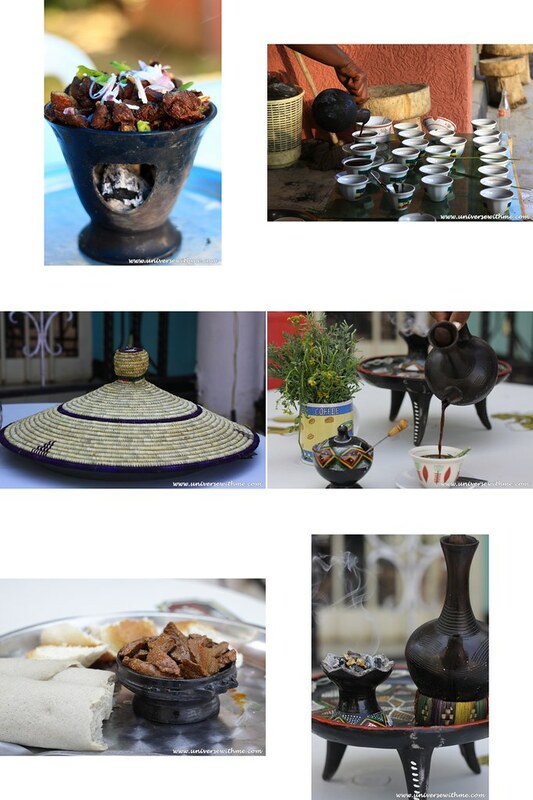 Sudan was known for hospitality. They usually let me pitch my tent at their yard and offered me tea. 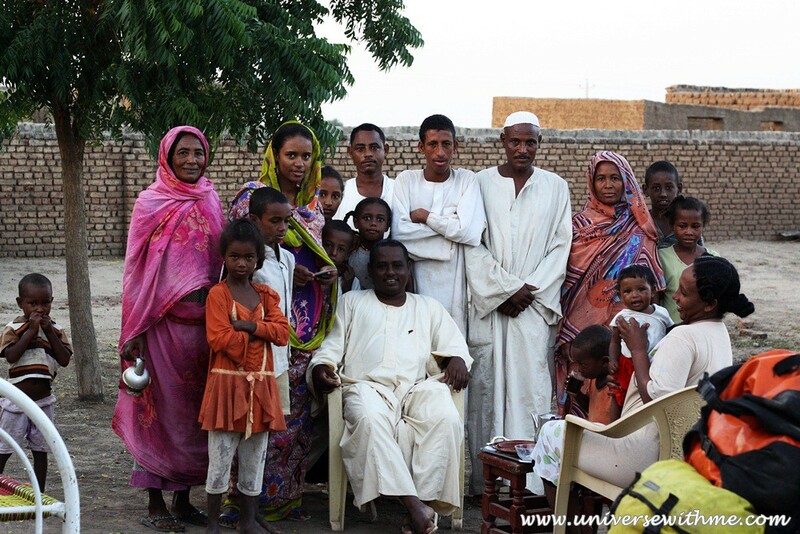 One weird thing was when I met local people personally in their house, they were polite and kind. But the people (males) I’ve faced on the street was very rude that they flirted, showed racist things, and bothered me too much every single day. I wished I could have had only a chance to see good things. I felt something weird on the rare wheel and I saw hub was shaking. I found a mechanic on the street. He told me he could fix it. But he spent whole morning that I sweated too much under the sun as keeping watching. It was weird that he moved a hub’s nut to the center. I didn’t know why he moved it. It should be placed at the end of hub. At the next day, my hub was cut. What a shocking thing I had to face. 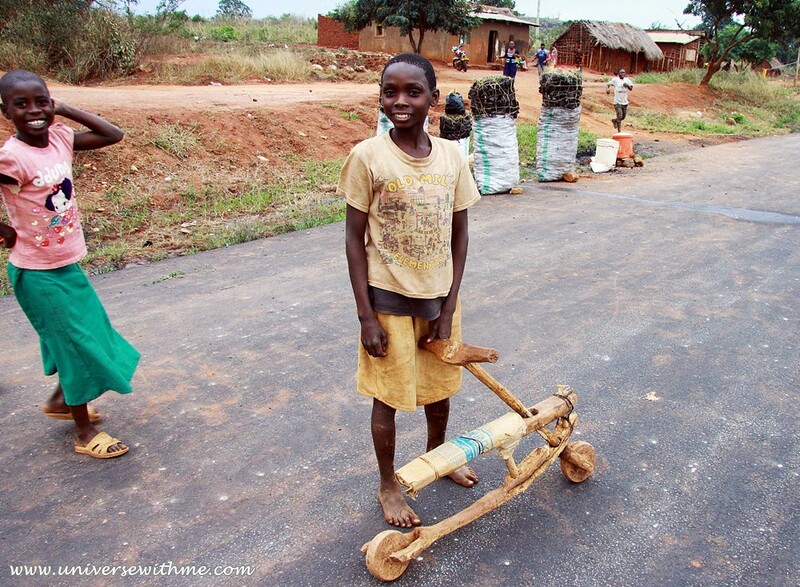 It was really difficult to find a good mechanic in Africa. Fortunately, I met another Swiss diplomat in the capital of Ethiopia who was working in the capital of Sudan. She hosted me and helped me to order a new bicycle part. It was time to cycle between the desert after fixing my bicycle. Everyday there was strong head wind. 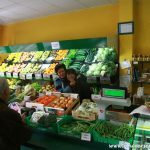 There was information about where small grocery and cafeteria at every miles on online. It helped me lot that I was not worried about where I had to sleep. I could have the plan with the information. Every 20~30 km (12.5 mi~18.75 mi) there was cafeteria. But all of cooker and server were only male. I set up tent where only males were every night. Fortunately I didn’t have any problem. I could not easily eat my food because of the vinegar flies at some village. So, I covered my face with a handkerchief. Ethiopian food was really varied. But in Sudan everyday it was same food beans, beans, and beans. Sudanese girl were really tall that I though it was because of beans. I found some old mosque which was built in 1779 by one family. It was too special place to explain with my words. Elder man showed me around and offered me a tea. 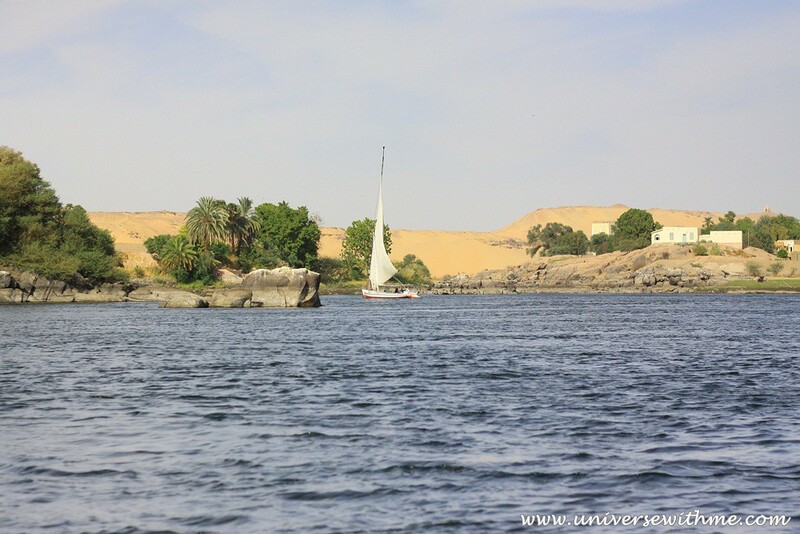 I was about to cross Nile river, but then he found a boat for me and went to Island together. He introduced me some local house where I could set up tent. I only spent day time with the elder man, but I was very sad to say good bye to him. He was the most kindest and generous man I’ve ever met in Africa. I overcame the fear and went out to take the picture of star trails in the night. There was nothing for 90 km (56 mi) to the immigration. It was time to choose about try to hitchhiking or do first wild camping in the trip. I didn’t want to get a ride that I decided to do wild camping. My first wild camping in the trip was in Africa! I was too scary to sleep well although it was at the middle of nothing. It was not possible to cross the border on the land that I had to take the ferry to Egypt from Sudan. The ferry was like refuge ship that too much people were everywhere on the ferry. It seemed like the ferry didn’t have limit number. I met other traveler on a ferry that I was not bored. The ferry took more than 12 hours. The resting room was separated by men and women. People lied down every where and it was very noisy. Lucky that I found an empty basement. So we slept there with sleeping bag. Anya, whom I met in the ferry and I shouted with full of happiness. She was crossing Africa that Egypt was her last country like me. I was really excited to arrive in my last country. She was a backpacker that we separated after immigration. But unfortunately in ten minutes I got sexually harassed on a bicycle. I could not believe how come it happened on a bicycle. A local guy on a motor cycle was touching my hip while moving and then he ran away. I already heard from other traveler that to cycle as a solo girl in Egypt could be more risky because of this thing. But I didn’t expect that it would happen as soon as I arrived. It was too much shocked and stressful in my trip ever. On the way to the city, some kids threw stones at me as well. Their skill was actually better than Ethiopian and Sudanese kids. I researched that 99% of Egyptian girl were suffering from sexual harassing. 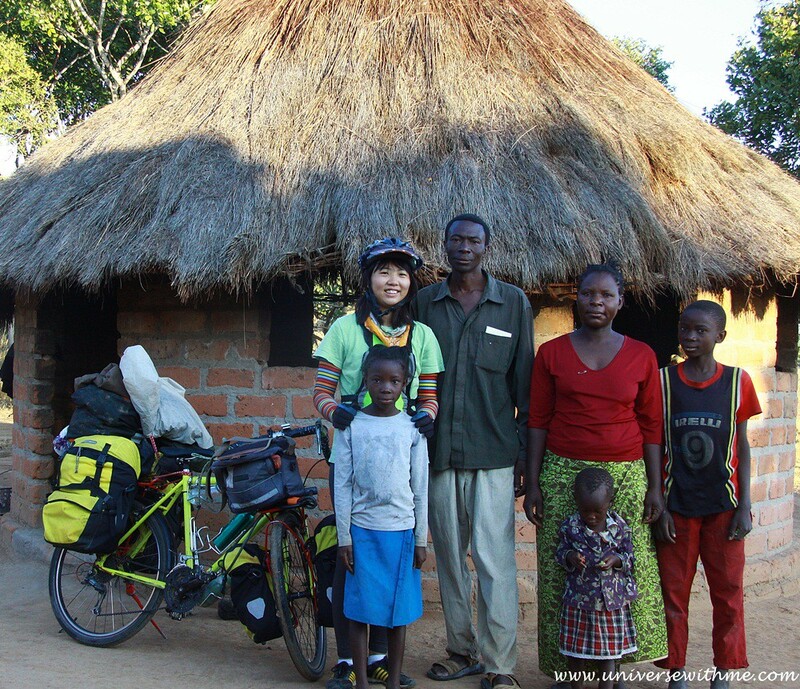 I met couple cyclist in Tanzania. He told me when he was a bit far from his girlfriend, some local Egyptian tried to bother his girlfriend. So he tried his best to stick his girlfriend all the time. I was worried that how I could cycle alone. I met Anya again later and my host hosted her and me. She also had horrible experience as soon as separating with me. While she was in a mini bus, one local guy asked her money from out of window. When she ignored it, he showed the knife to his throat to threaten her. She and I were in a panic when we met again. The host invited us boat trip around the river at the next day. I was getting better from that shocked. It was such a different world on a boat. I thought that to take a boat and have a tea and lunch on Nile River were true traveling. 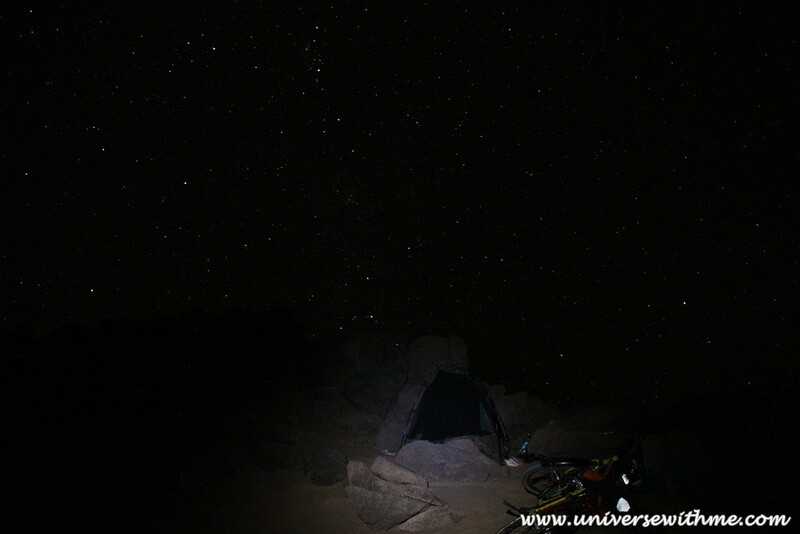 What I was doing with a bike in Africa was not traveling, but survival game. As I was traveling in Egypt, the politic situation was very complicating. The government of U.S and other country warned people not to go to Egypt. But actually I didn’t feel much danger. 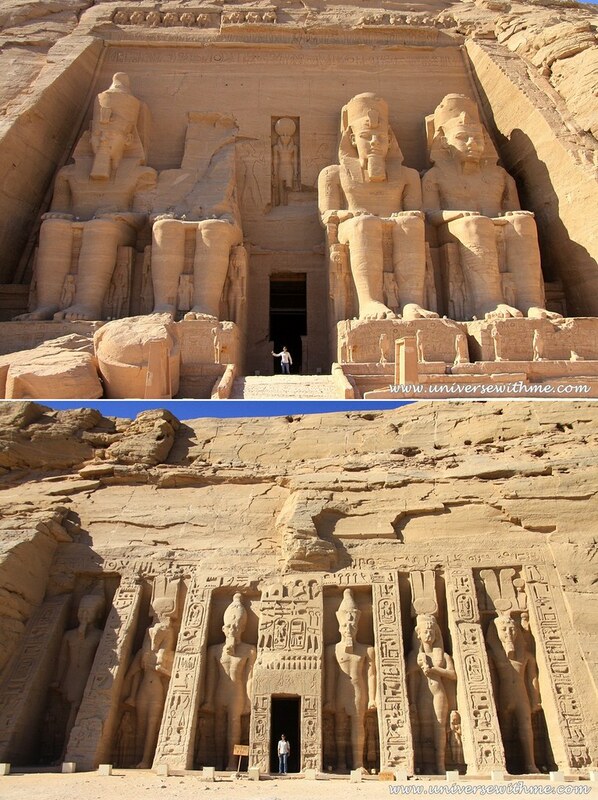 I was looking for a tour company for going to Abu Simbel, one of famous ruins in the world. But companies told me that there was no tourist who wanted to go there that they could not arrange a car. I decided to go by myself with local mini bus. And it was shocking that I was only one tourist in an amazing tourist attraction. I felt like I bought the place. I was afraid of keeping cycling alone in Egypt. 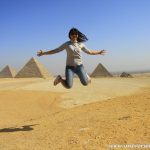 So, I was looking for a partner that I posted Egypt facebook pages and groups. 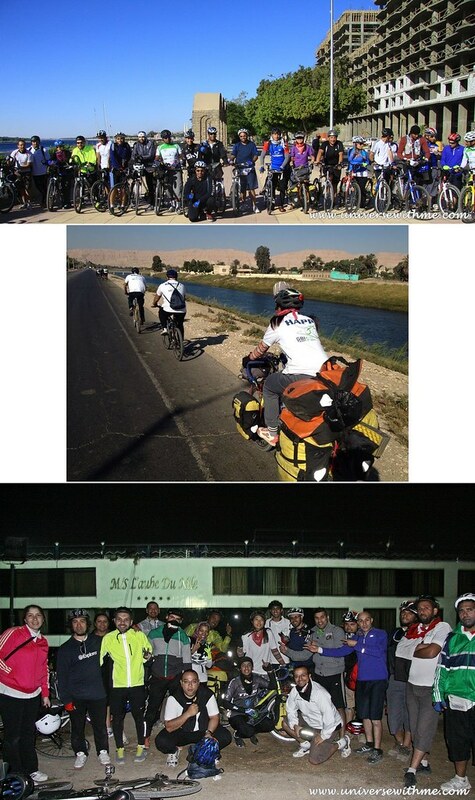 And GBI Egypt, the biggest well organized cycling group in Egypt, contacted to me. They told me they had an event for three nights and four days and they would rent a cruise and cycle together. The cruise was expensive for me that I could not join. Then members donated my entrance fee to invite me. It was one of the best memory in the trip that I cycled with many local people together. Also it was fantastic to sleep in cruise after cycling hard. Thank to them, my bad memory turned to good memory. 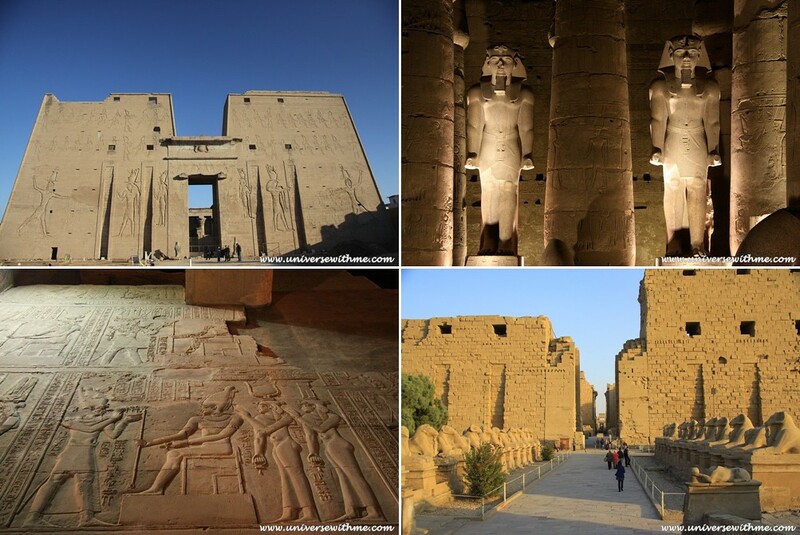 I really liked Egyptian Ruins. I was very interested of their gods that I studied about it while touring. After meeting GBI Egypt, I took the bus to the sea. I heard there would be less people on the coast that it could be easy to cycle for me. Fortunately I didn’t have any problem while cycling at the next to Red sea. Just before Cairo, the capital of Egypt, I got help from one of member from GBI Egypt that I could enter to the city safely. 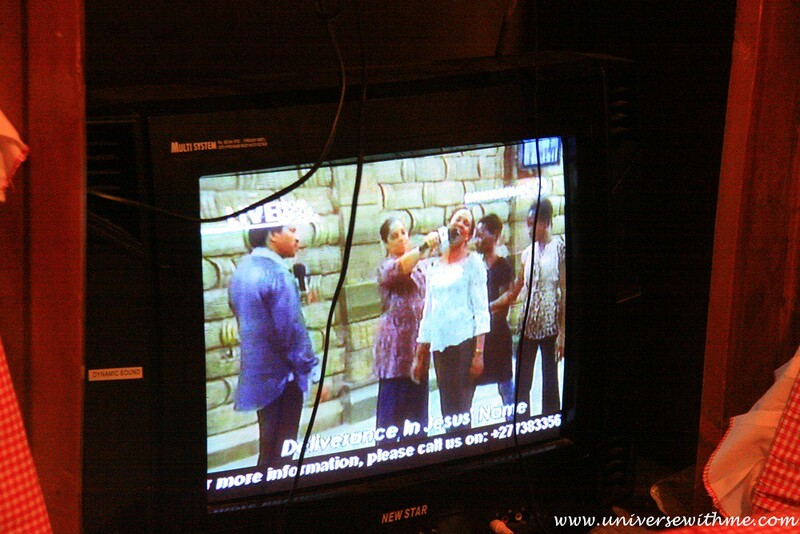 Through GBI Egypt, I got the chance to have an interview on the cable channel on TV. After touring Pyramid, my cycling tour was finished. Physically to cycle in Africa was easier than in Americas. Maybe because it was my second year. Also I didn’t have much accident compared to cycling in Latin America. My distance of cycling in Africa on a bicycle was longer than in Americas as well because I tried to cycle most of times without getting a ride. Only one hard thing was I got too much stress, for I was an Asian girl alone. Anyway it was lucky that I really didn’t have any dangerous situation. I cycled for 364 days and passed ten countries. I spent around $4000 in Africa. Flight from Brazil to South Africa was $1,271. 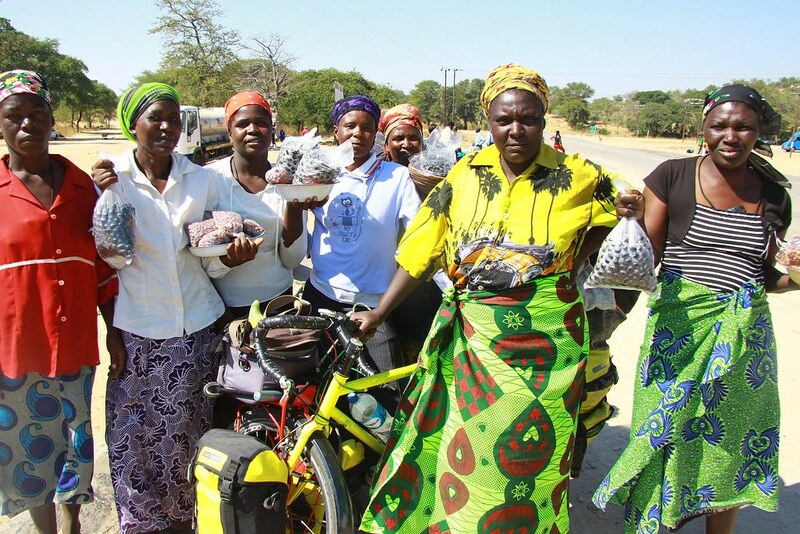 So total $5,271 for cycling in Africa. I ate many different kind of food. Ethiopian food was definitely my favorite one. I had met so many people while cycling. Many of them helped me on the road that I felt thankful. 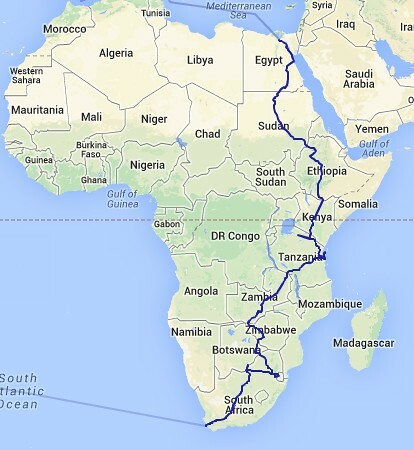 The route of cycling in Africa. When I was cycling in Americas, I had told people I will go to Africa. But I was not sure it was possible. I just told like that because Africa was the part of the world. 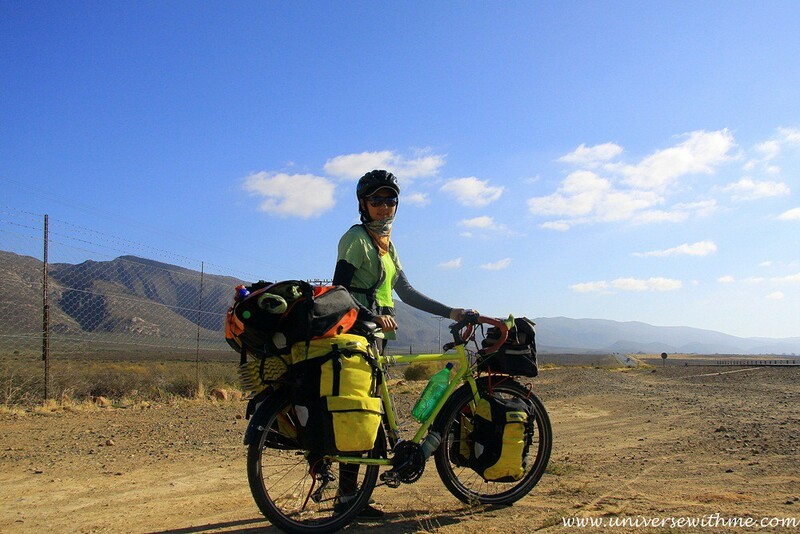 Now I realize it was possible to cycle in Africa as a solo girl. I would like to thank to local people and foreigner who helped me on the road. I appreciate to my donors who made my trip long-term travel. Thank to all for everything. The story which looked impossible was finally finished here. I had spent much time to edit the video. But the video has too bad quality. Also I didn’t take much video in Africa and didn’t have good camcorder that there were not enough videos to put. I wanted to take the ferry from Egypt to Turkey, but I couldn’t find. So I flew to Spain. How it would like to cycle in Europe? I wanted to see Aurora which I saw in Canada. So my plan would be going to Finland. I was not sure it would be possible. I always do something I am not sure it is possible. I like just to try and see it is possible. That’s how I got here. After one year I was in the middle of winter in Finland. 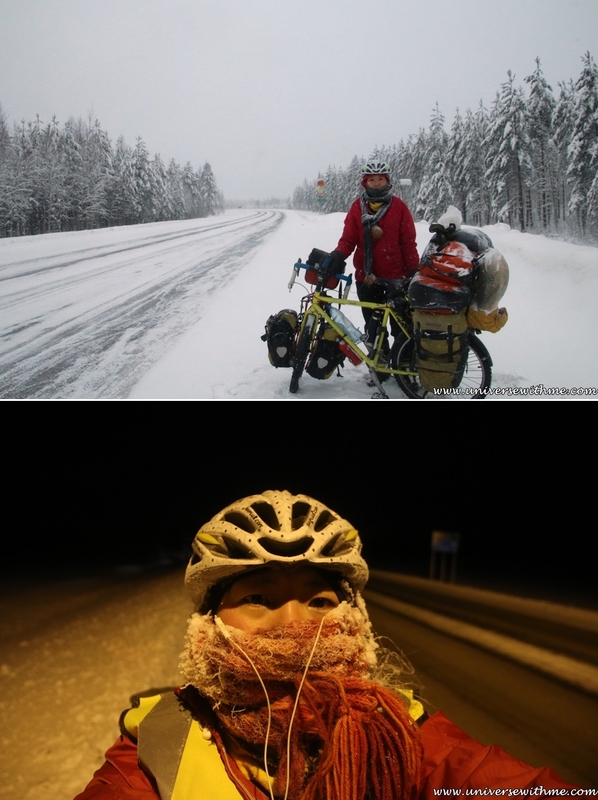 I made a record that I cycled under -21 c (-5 Fahrenheit). To see Aurora again would be possible? You guys are incredible as well 🙂 I enjoyed talking with you guys! Contratulations! Your blog is amazing, and i really admire you. I am a french man, living in Shanghai China, in 2011 i cycled from Shanghai to Lyon (my home town in France). I was a 9,300kms journey, which i did within 6 months…but you! …you are amazing! My blog: http://www.ambroise-baz.com you can check if you have time. I will donate something to you now, i hope it pays a few meals on your way to Universe. Thank you for the comment and donation.